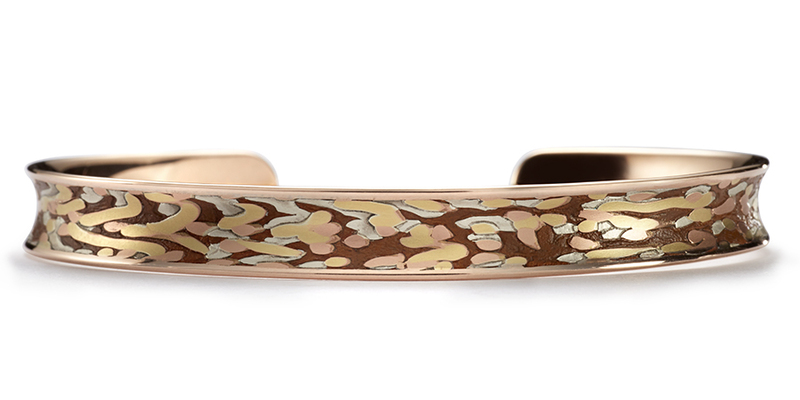 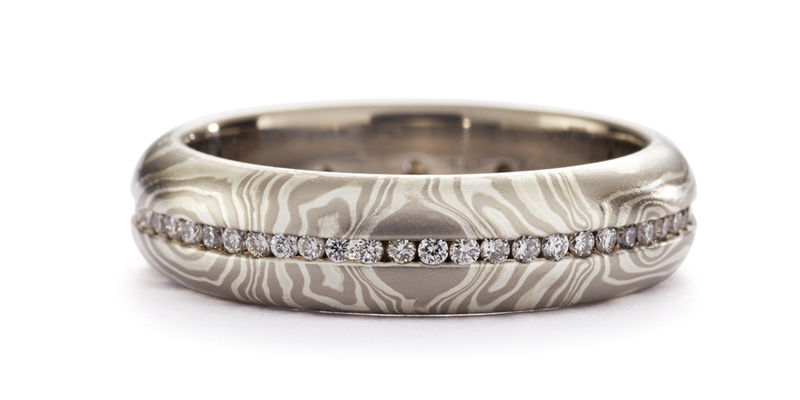 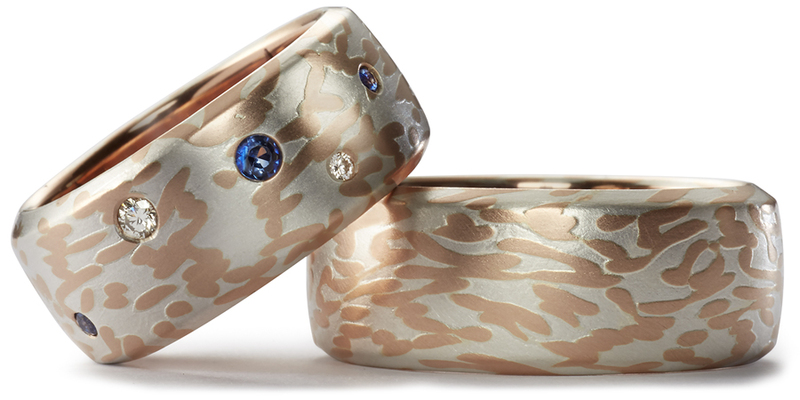 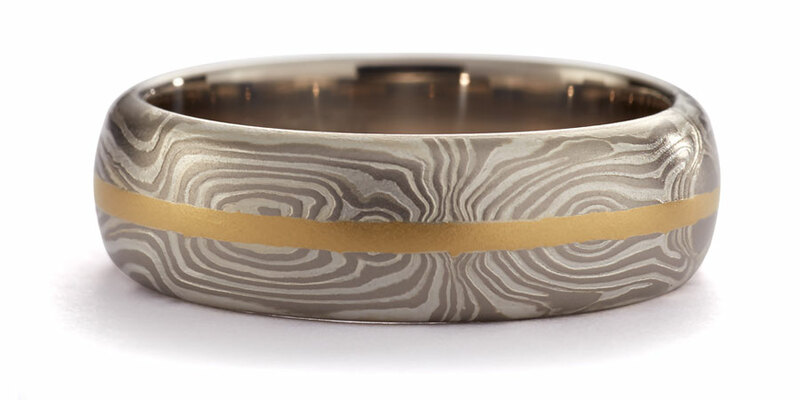 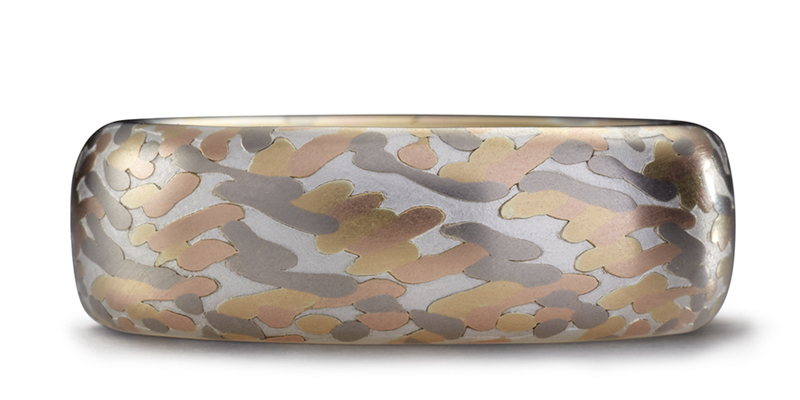 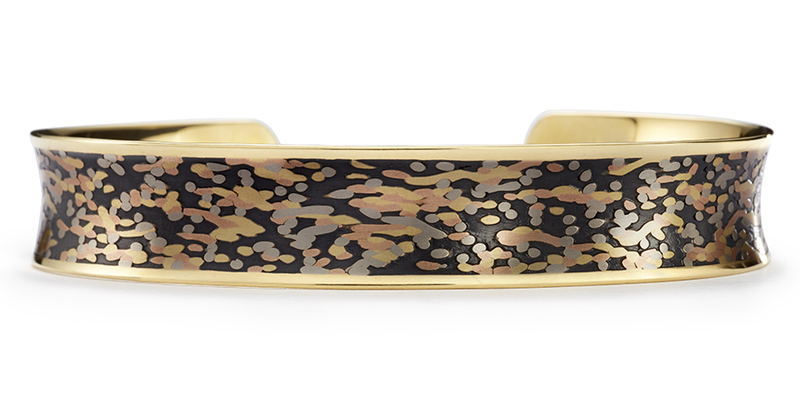 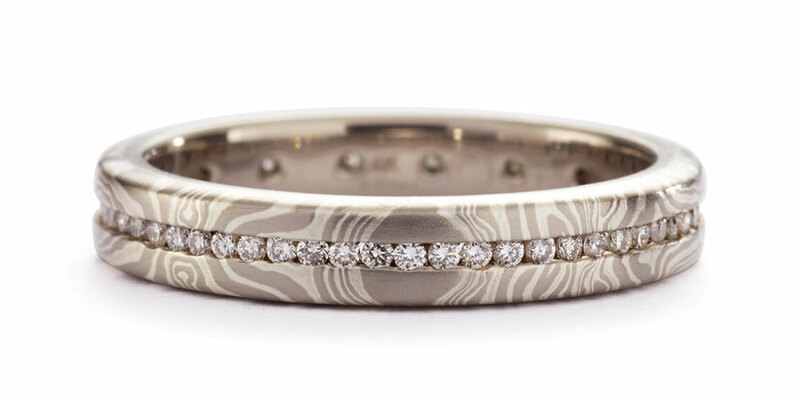 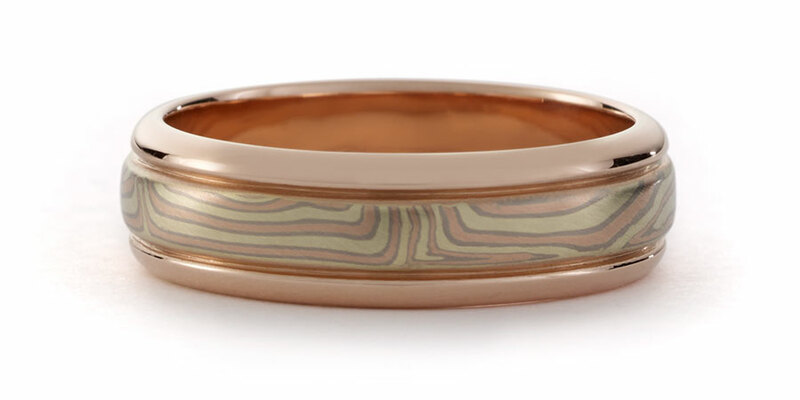 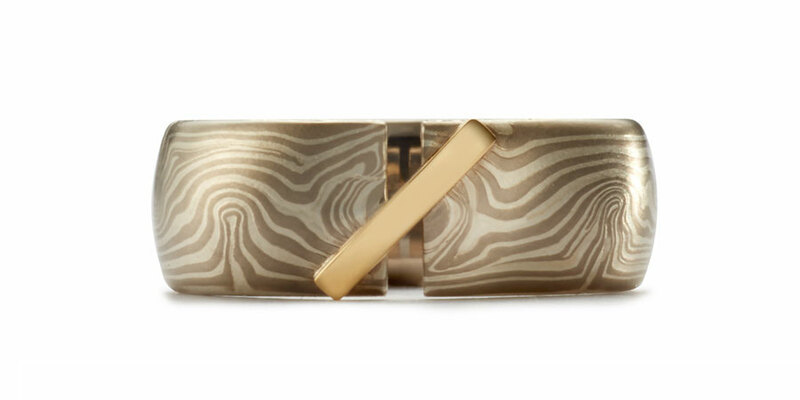 They feature George’s signature edge grain mokume. 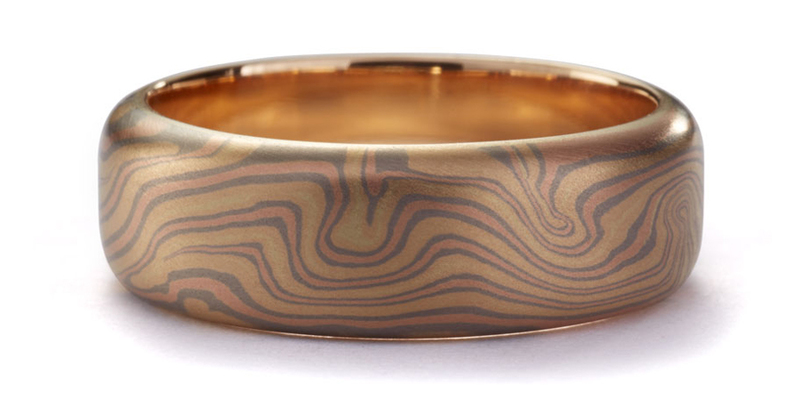 There are 8 color combinations available in the mokume color palette and many widths. 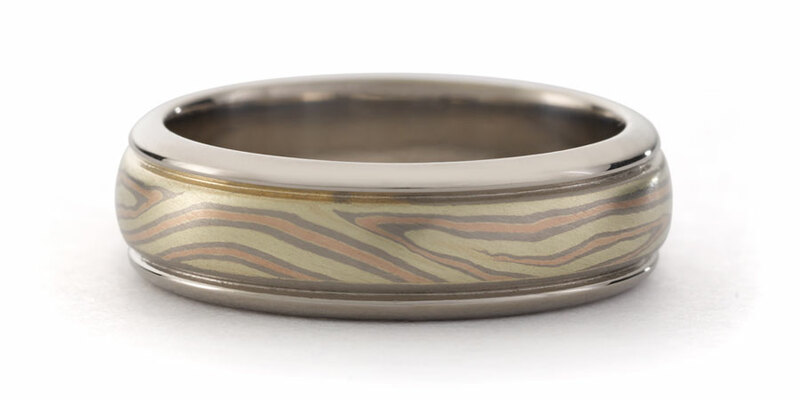 HALF ROUND & FLAT RINGS Available in 10mm, 8mm, 7mm, 6mm, 5mm & 3.6mm widths. HALF ROUND & FLAT RINGS WITH ADDED STONES Available in 10mm, 8mm, 7mm, 6mm, 5mm & 3.6mm widths. 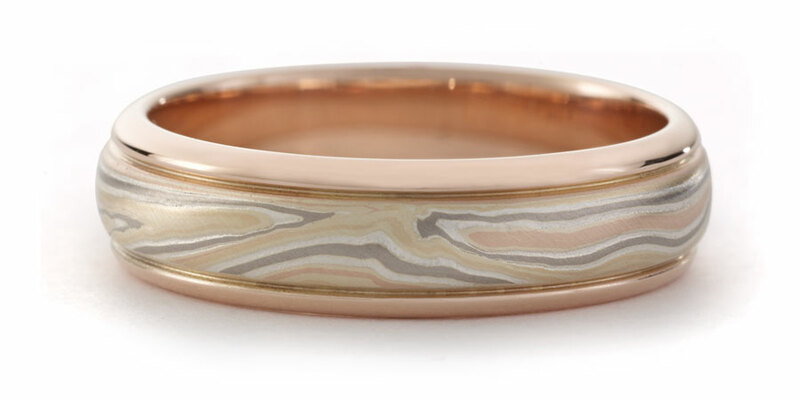 HALF ROUND & FLAT RINGS IN SOLID COLORS Available in 10mm, 8mm, 7mm, 6mm, 5mm & 3.6mm widths. 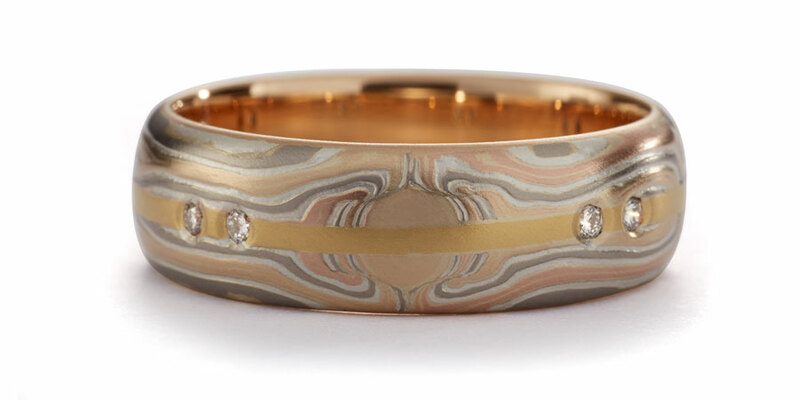 They have 7 color combinations in 3 edge colors available in the mokume color palette. ROUND EDGE RINGS Available in 10mm, 8mm, 7mm & 6mm widths. 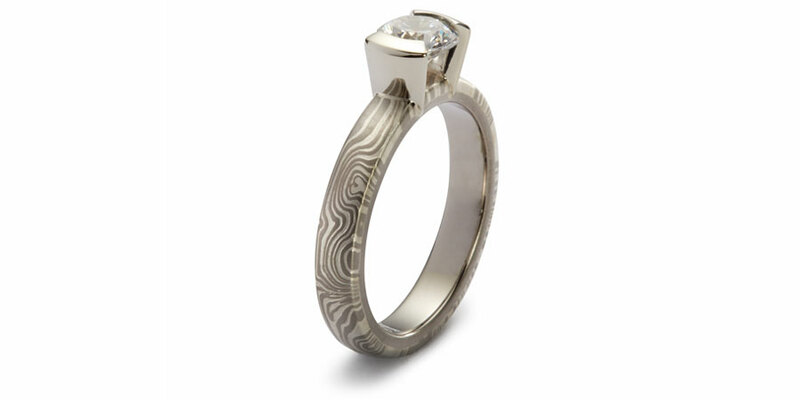 DIMENSIONAL CENTER Available in 6mm & 5mm widths. 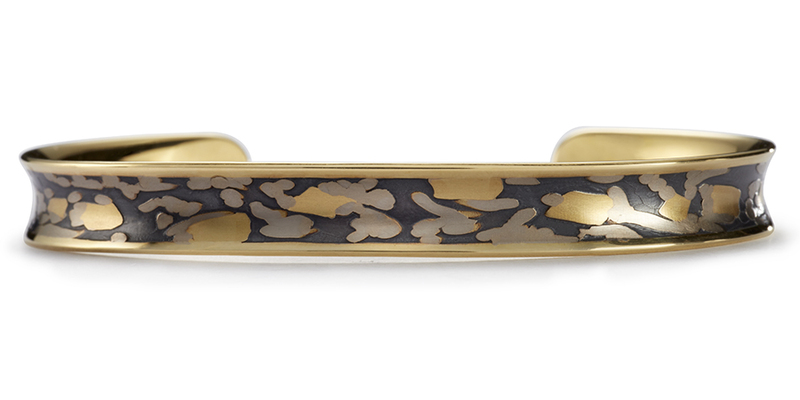 FLUSH CENTER Available in 8mm, 7mm, 6mm & 5mm widths. 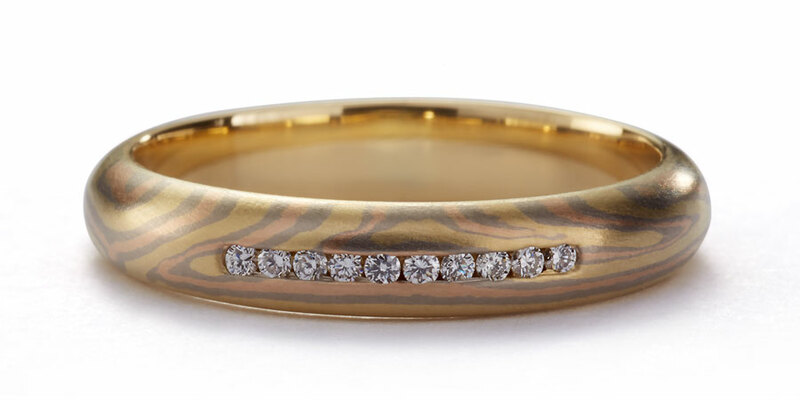 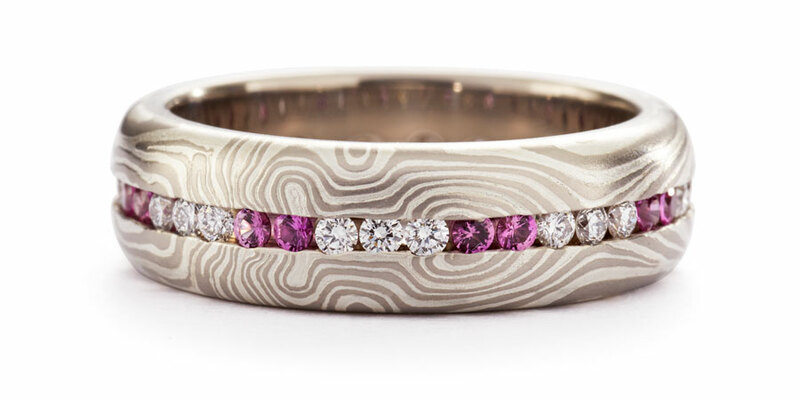 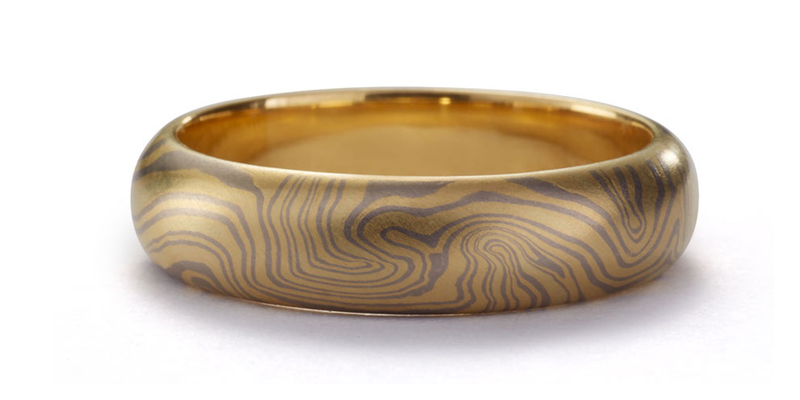 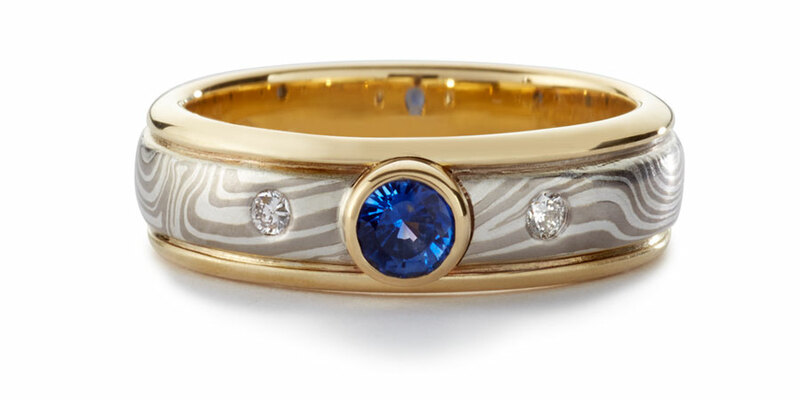 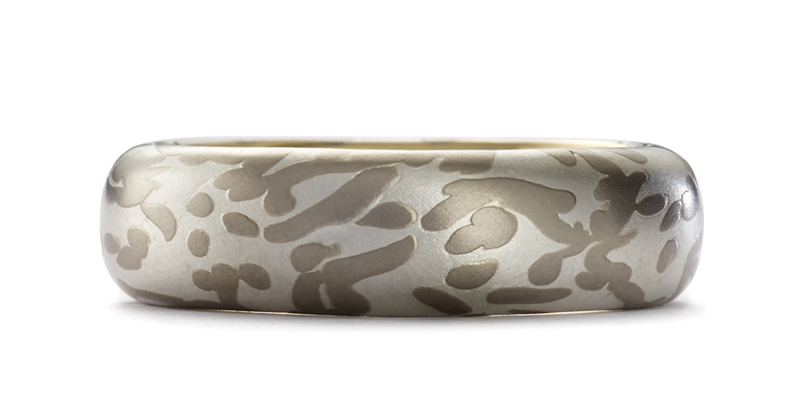 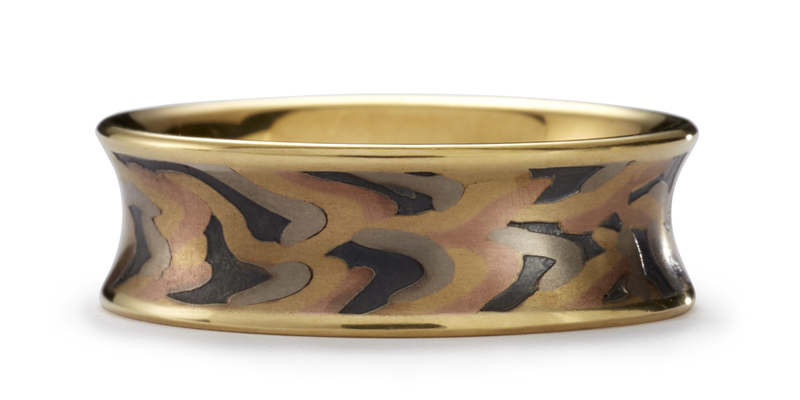 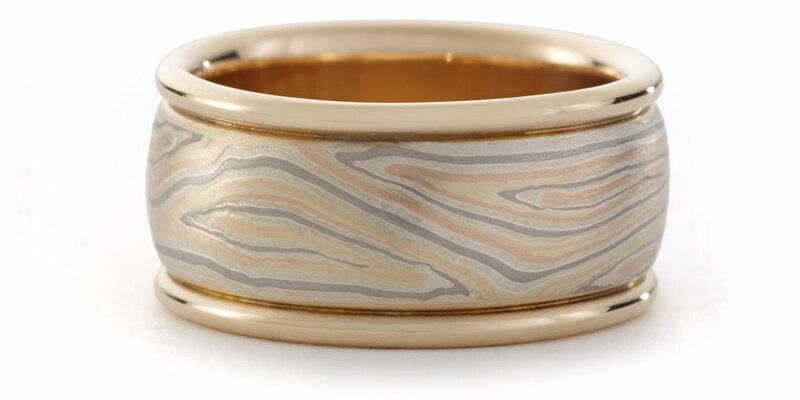 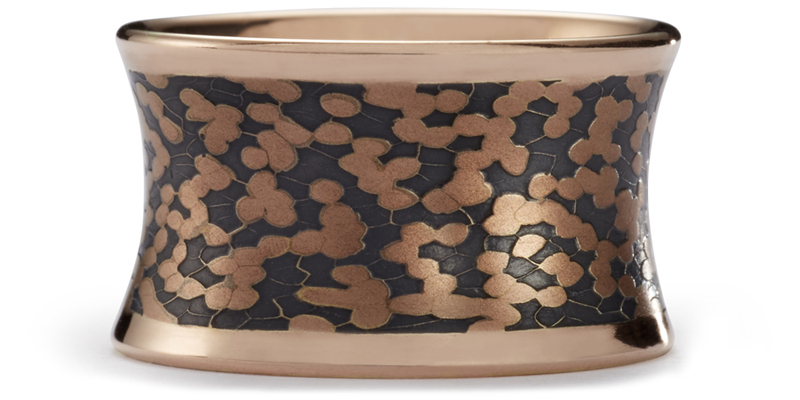 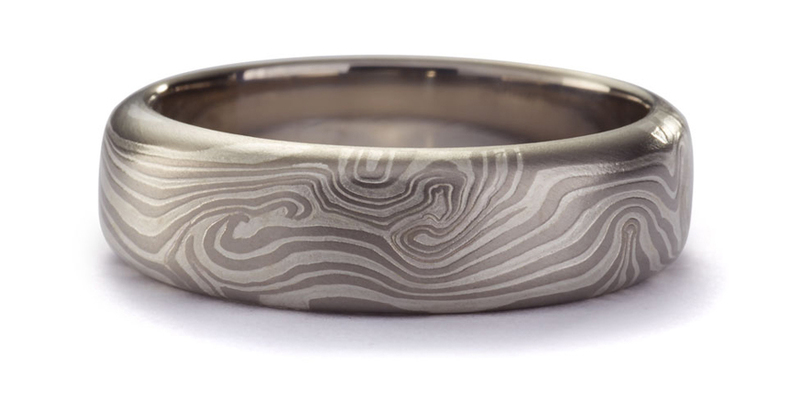 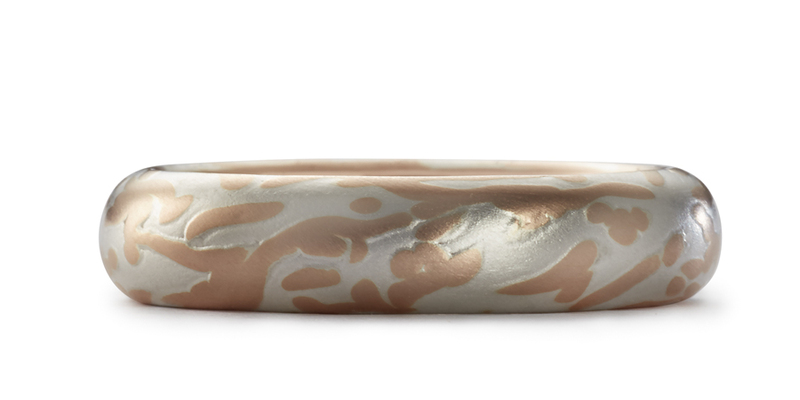 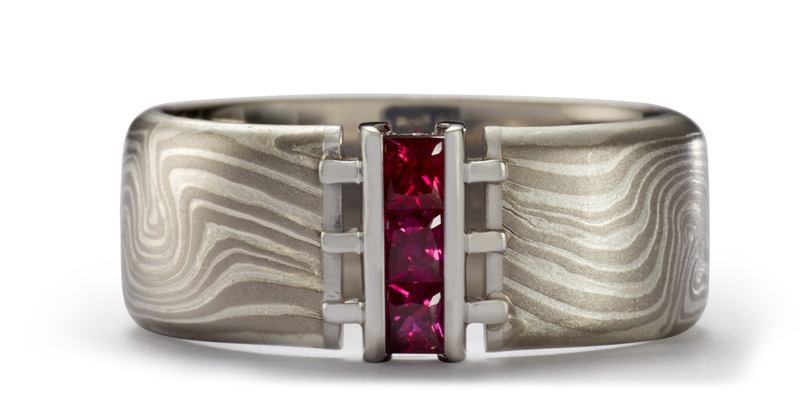 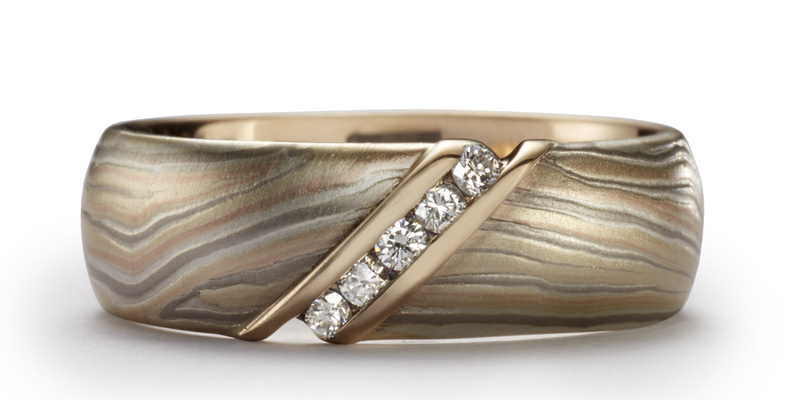 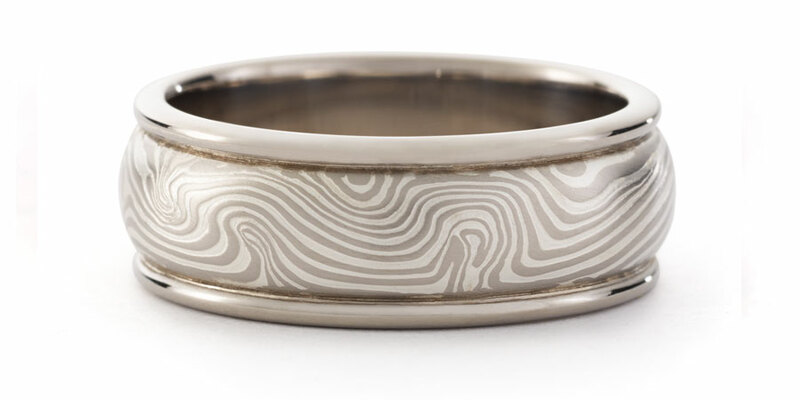 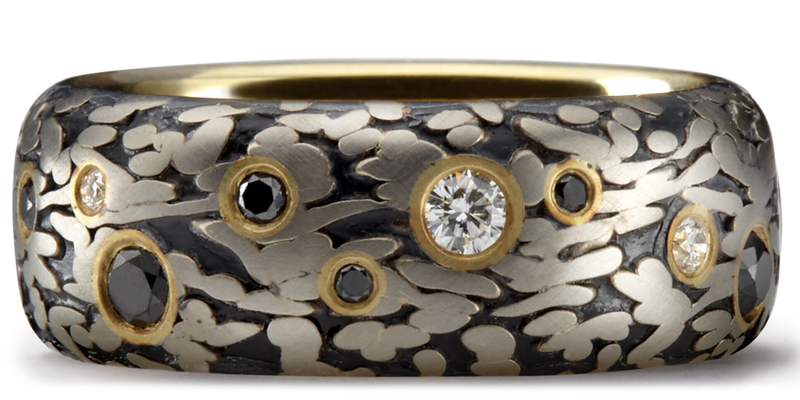 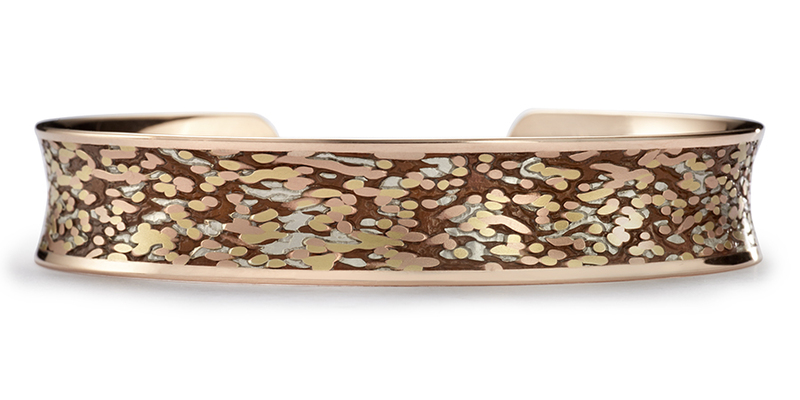 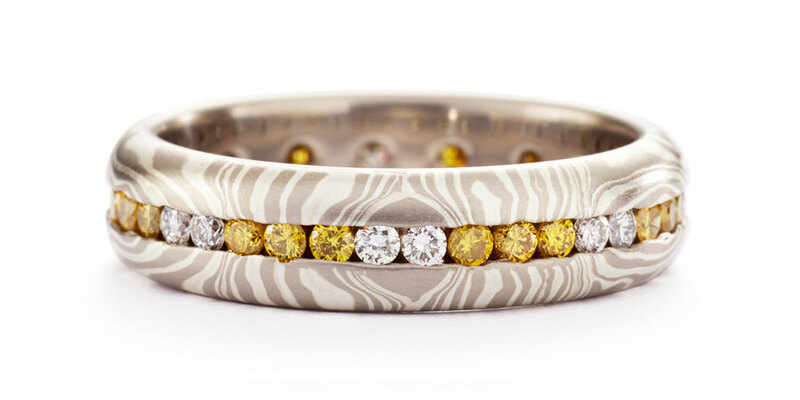 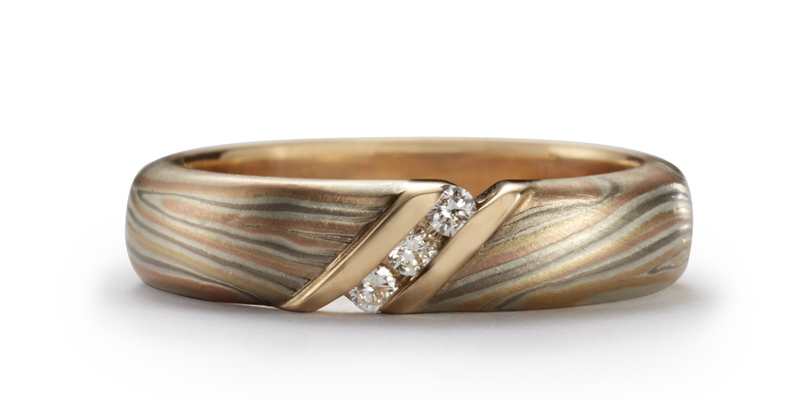 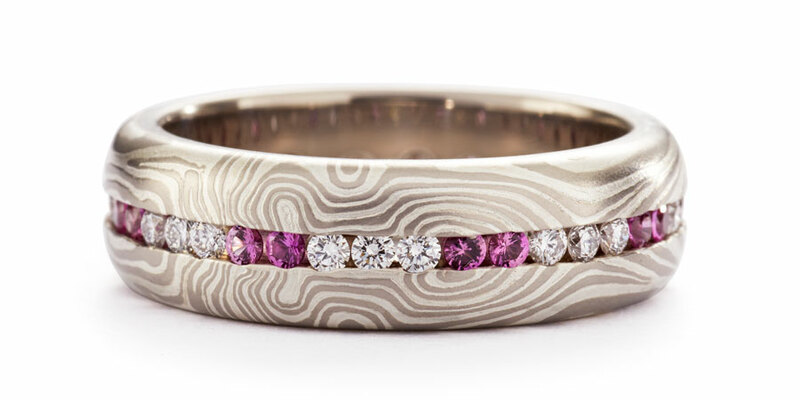 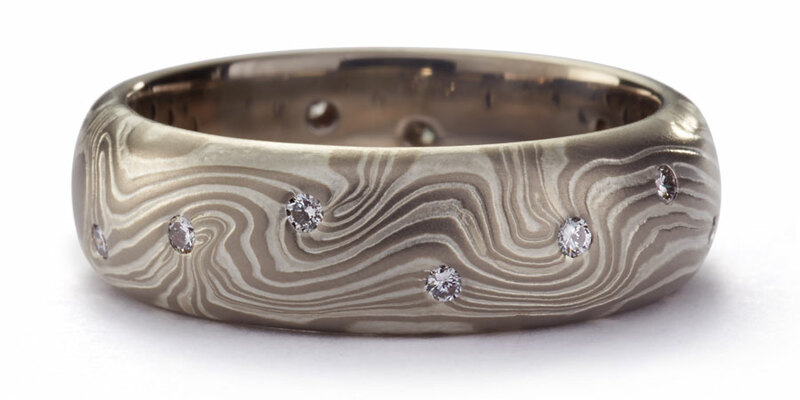 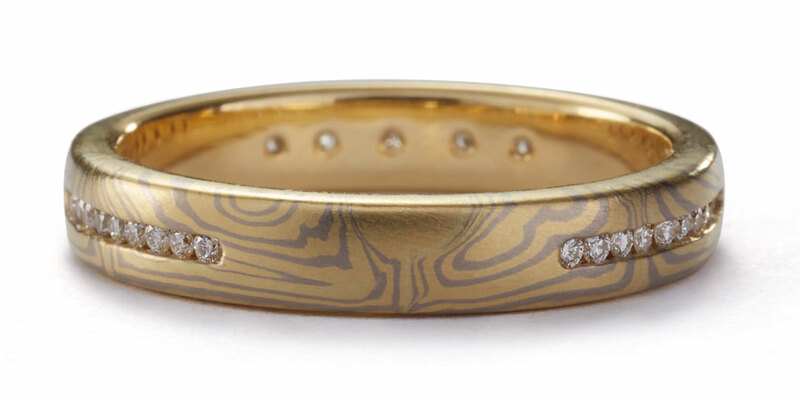 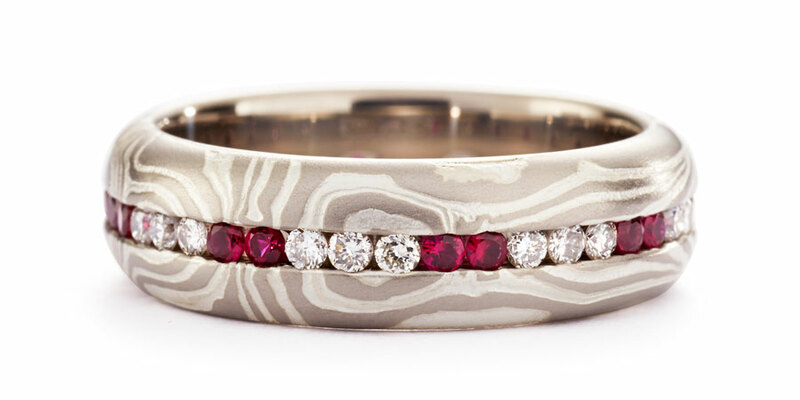 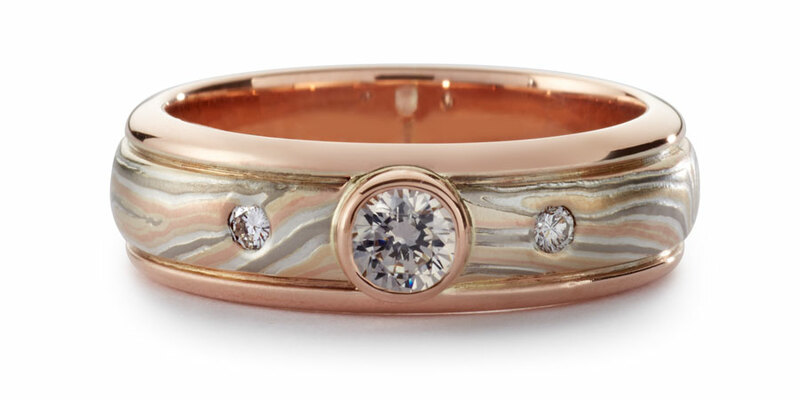 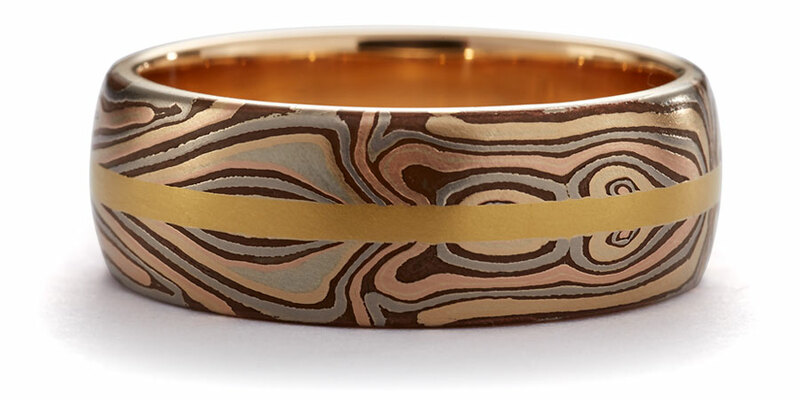 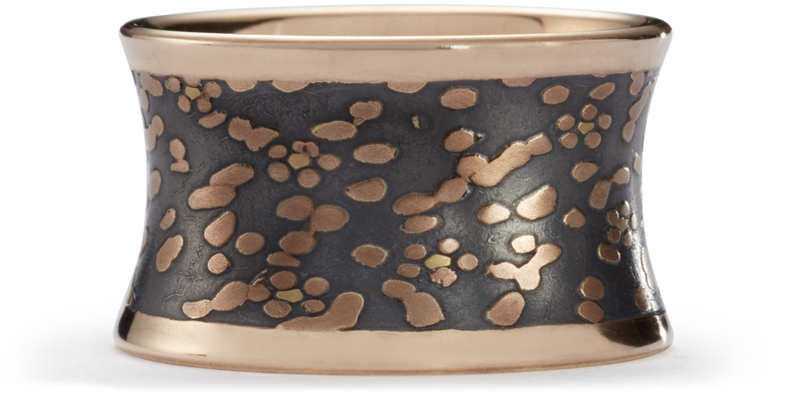 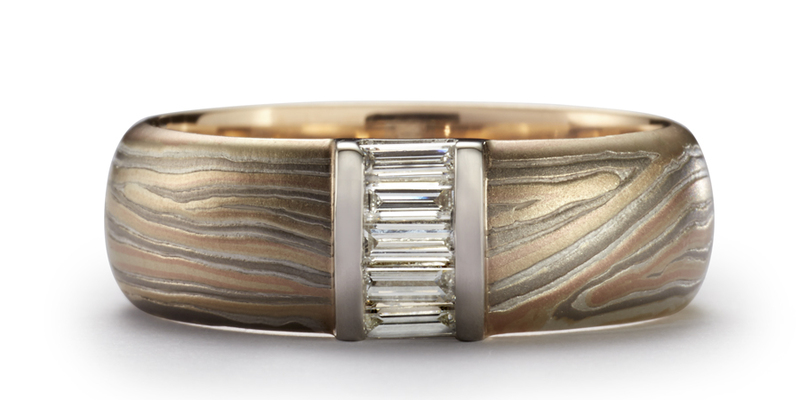 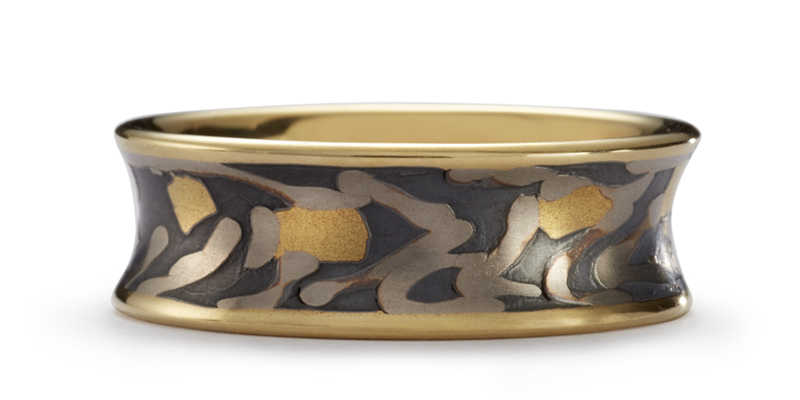 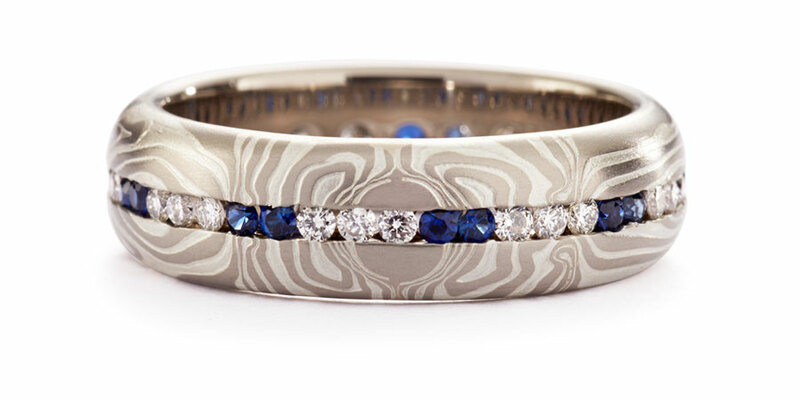 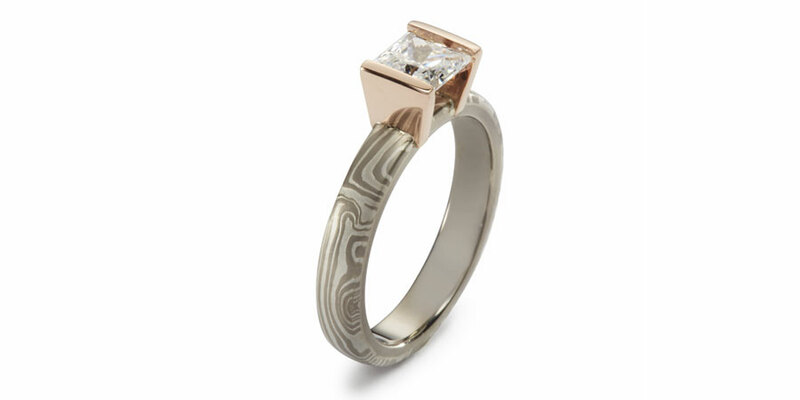 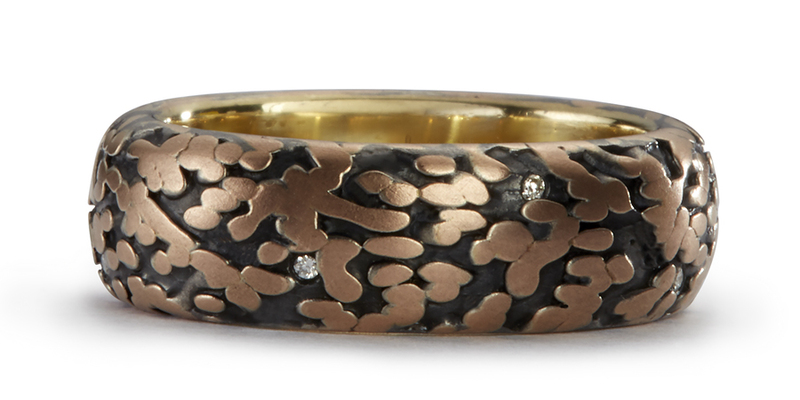 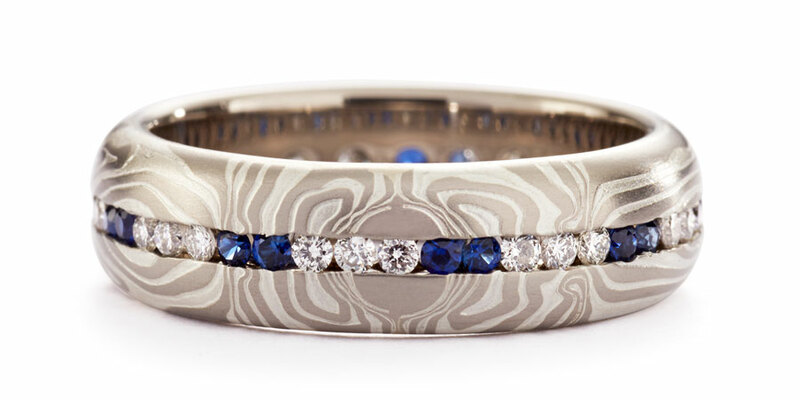 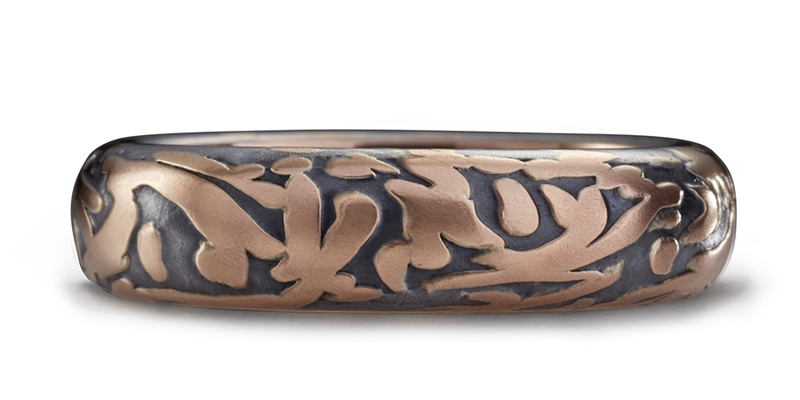 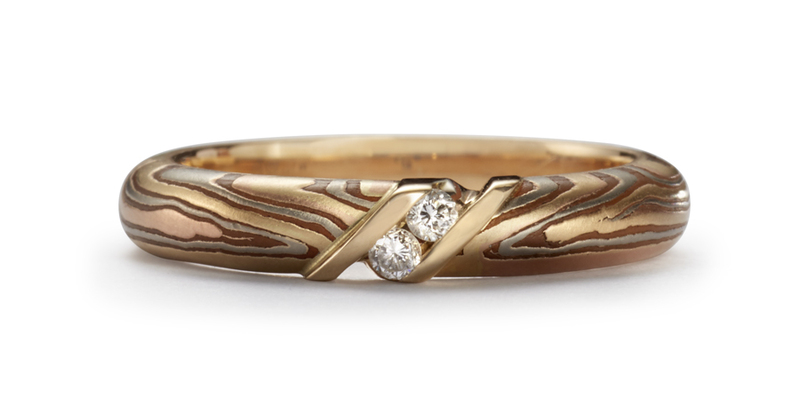 Connections Rings contrast the soft curving quality of George’s signature edge grain mokume with the bold, architectural geometry of the connection. 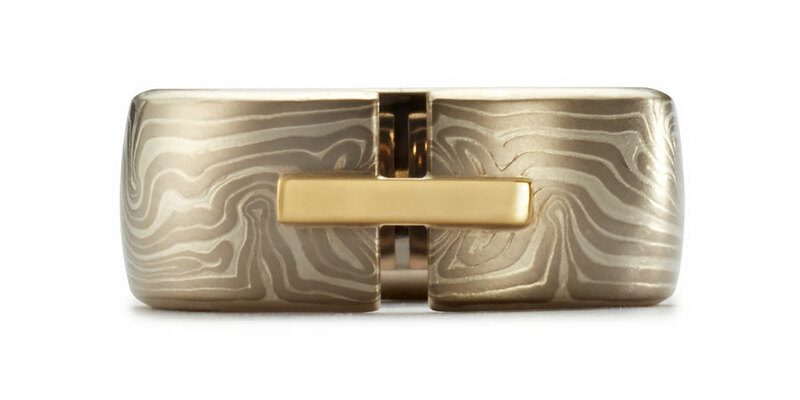 The emptiness of the cut with the solidity of the connector. 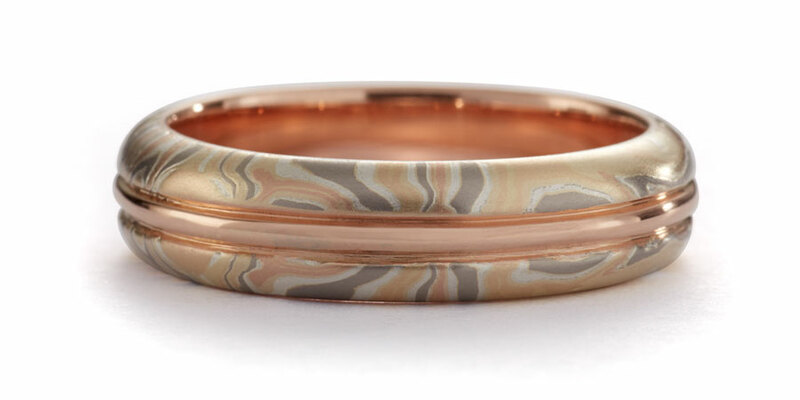 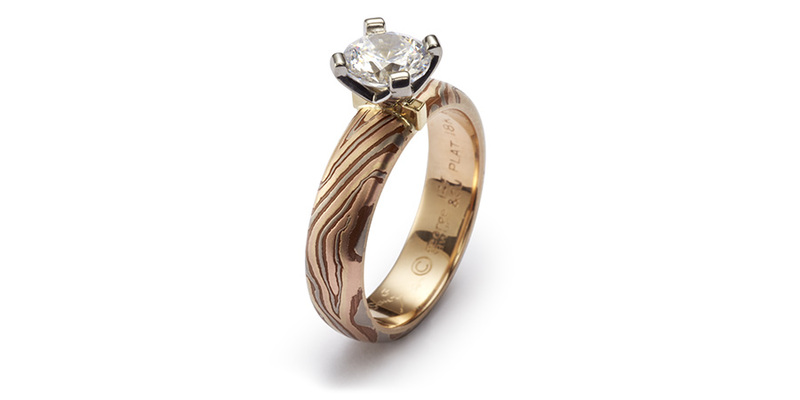 There are 8 color combinations available in the mokume color palette, rings come in 10mm and 8mm widths. 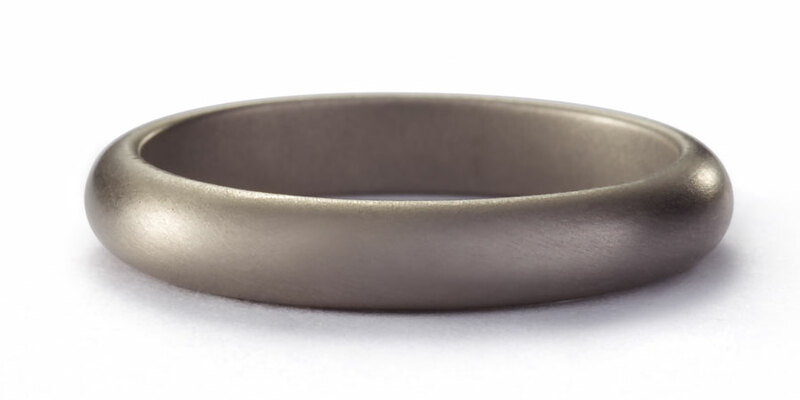 CONNECTIONS Available in 10mm & 8mm widths. 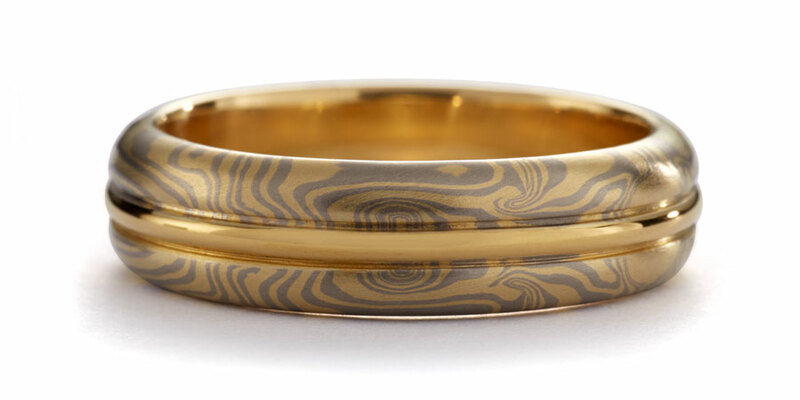 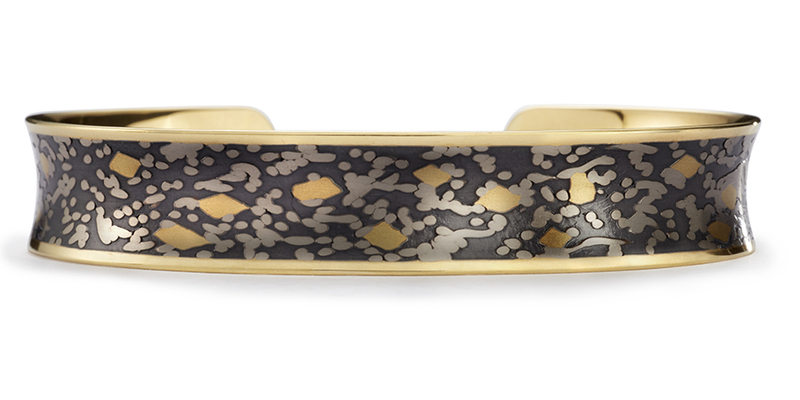 The Koi® and Wabi Sabi™ patterns are a cousin to my original gold mokume gane. 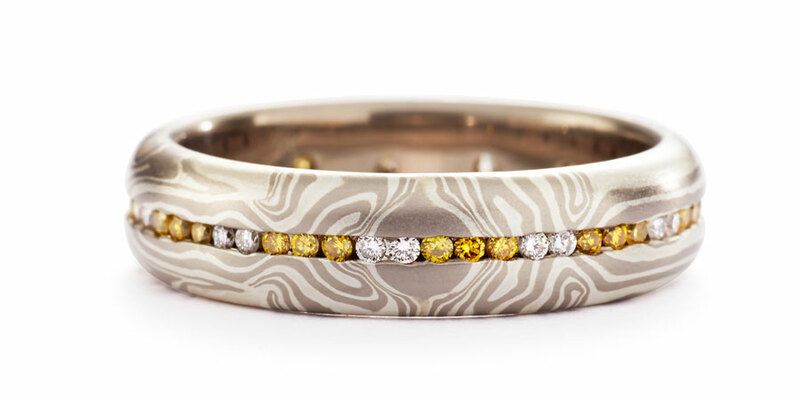 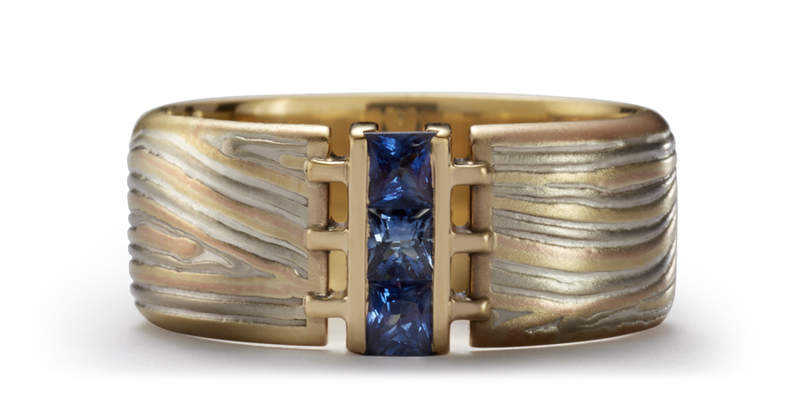 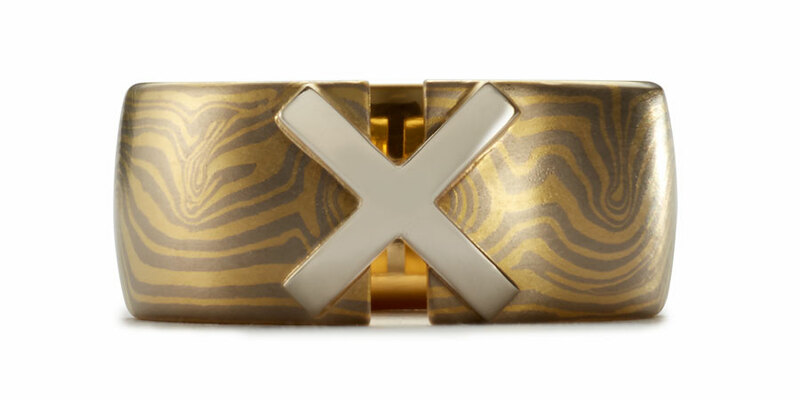 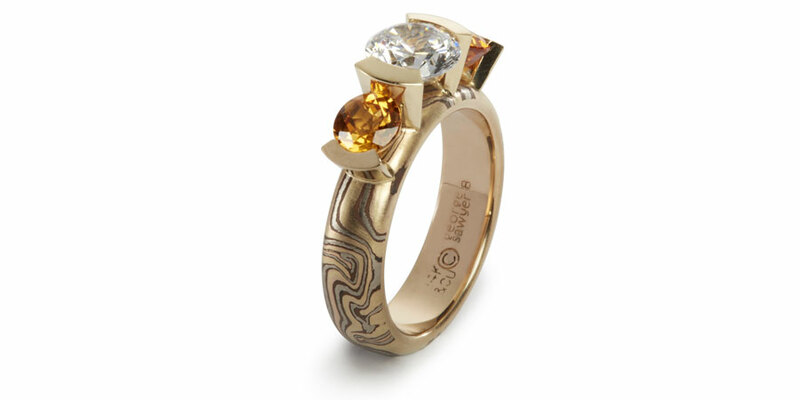 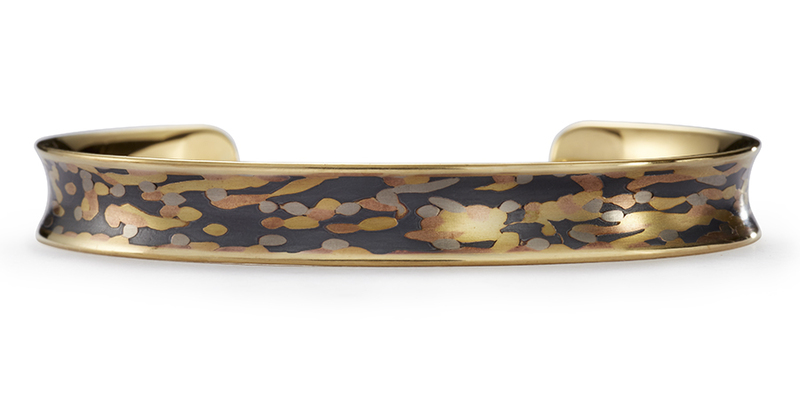 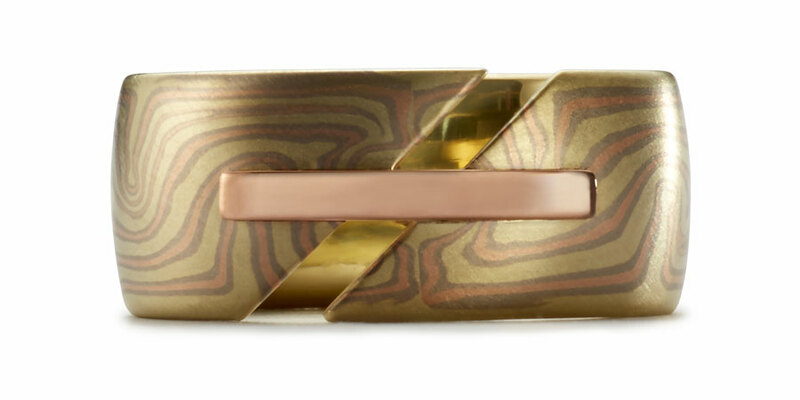 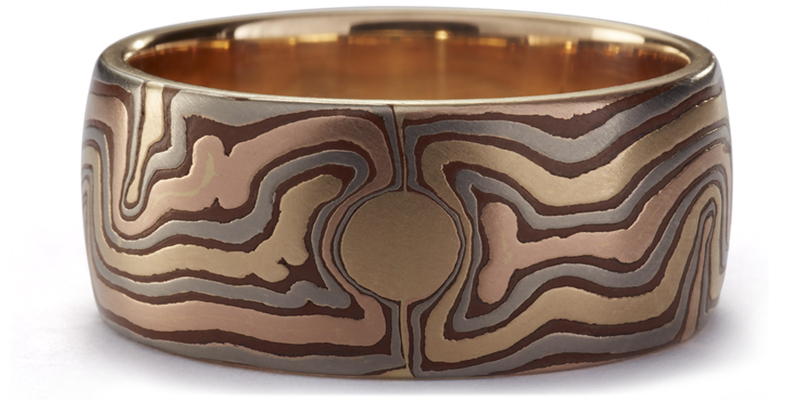 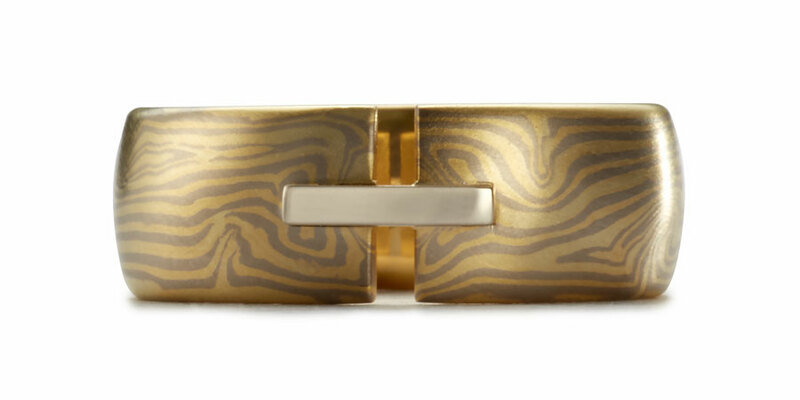 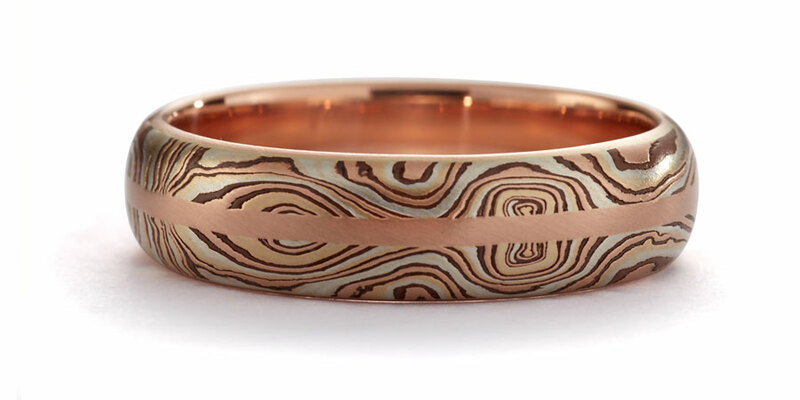 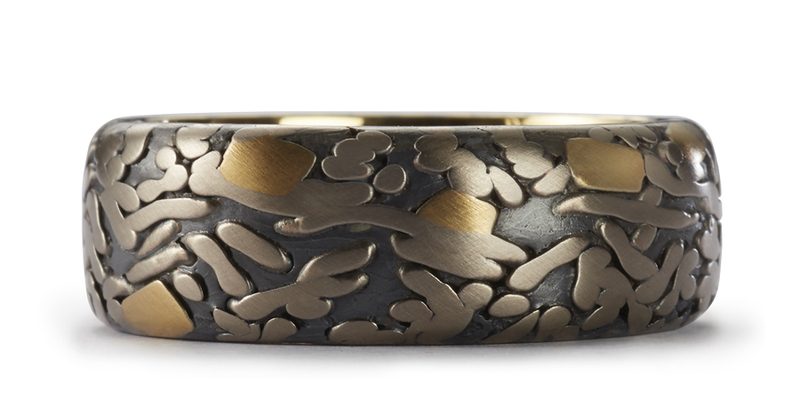 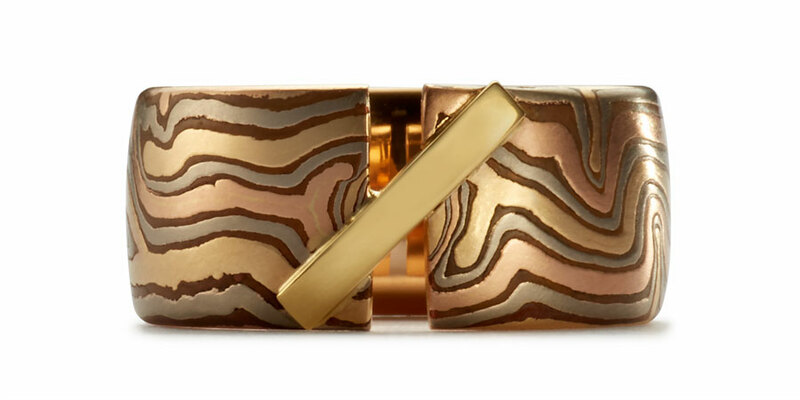 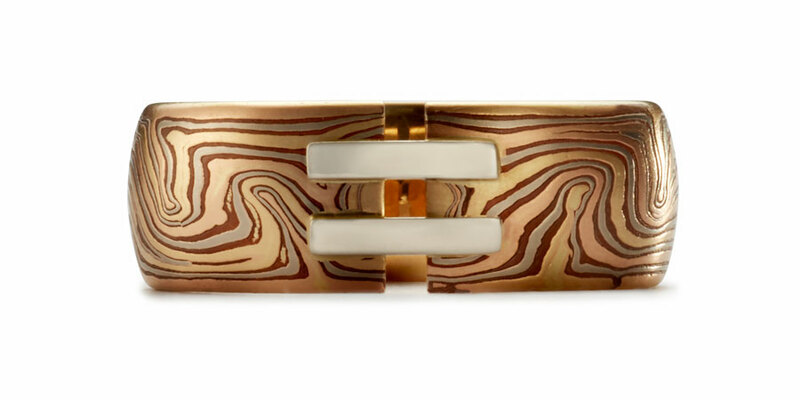 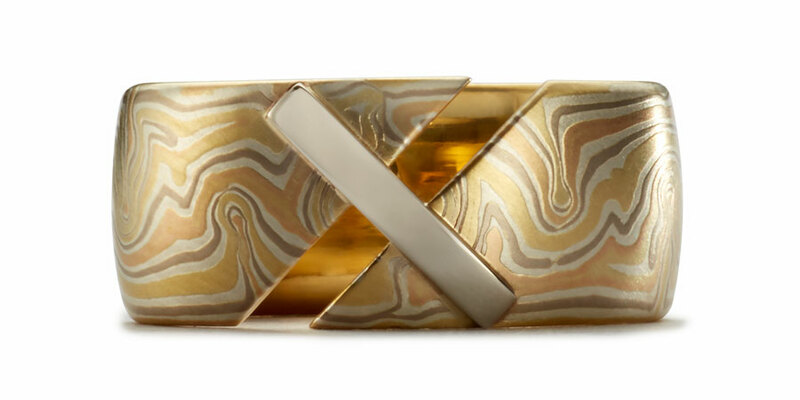 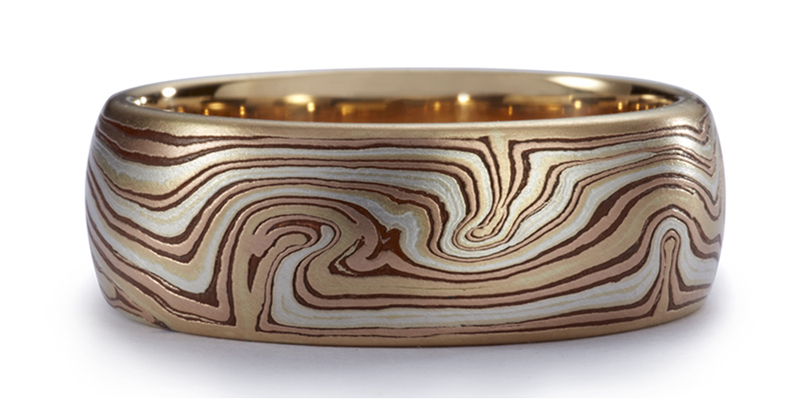 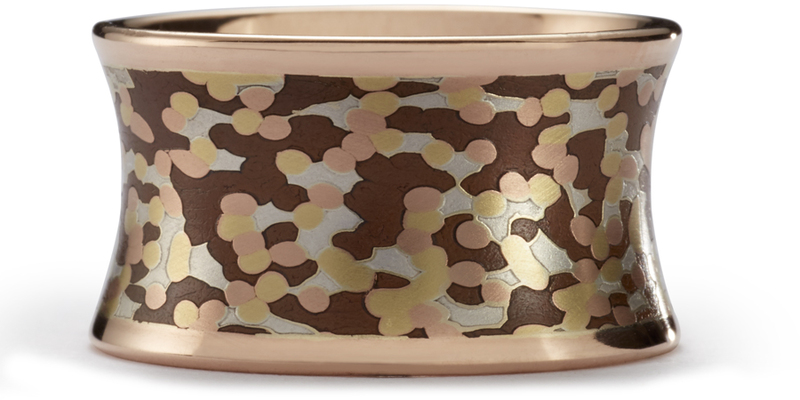 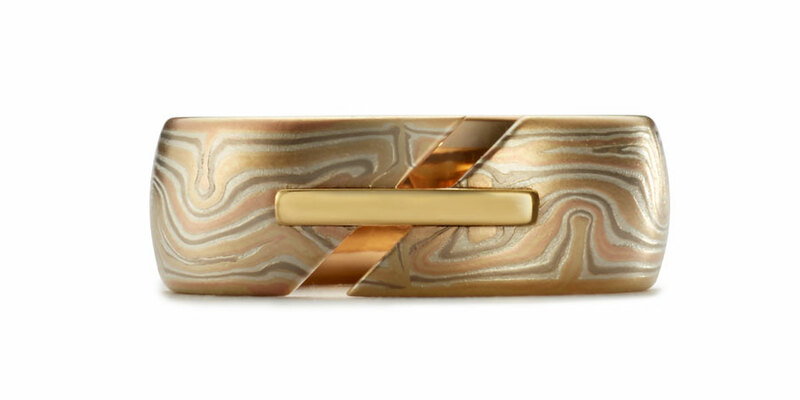 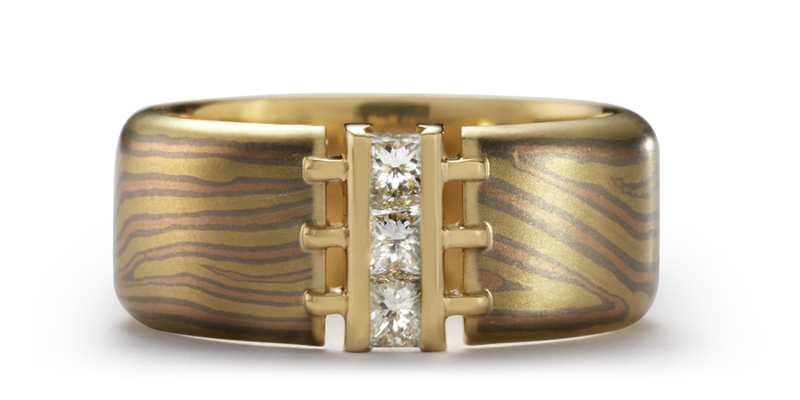 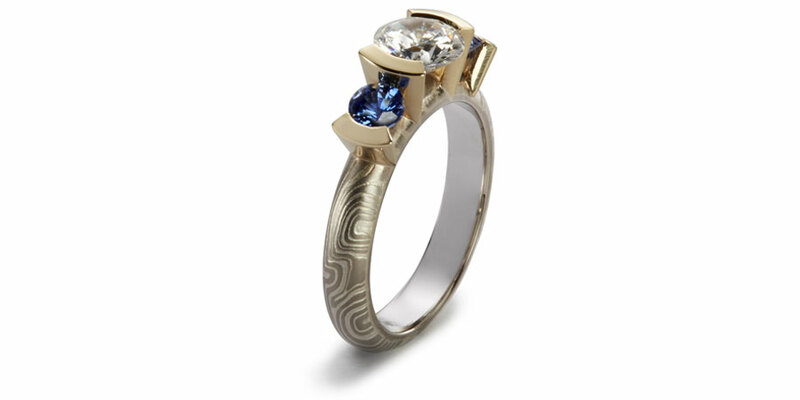 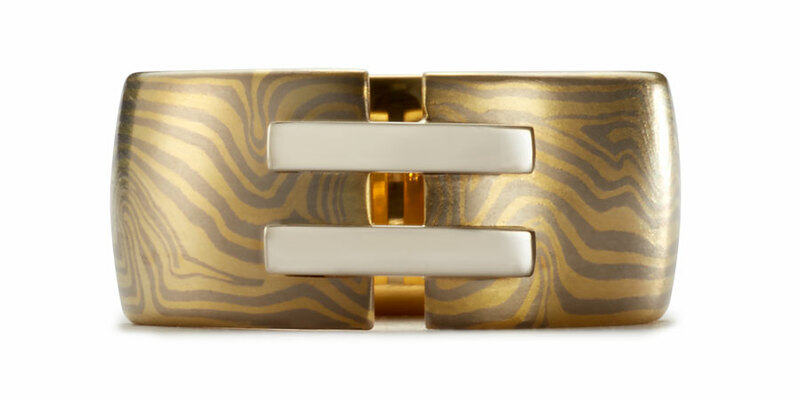 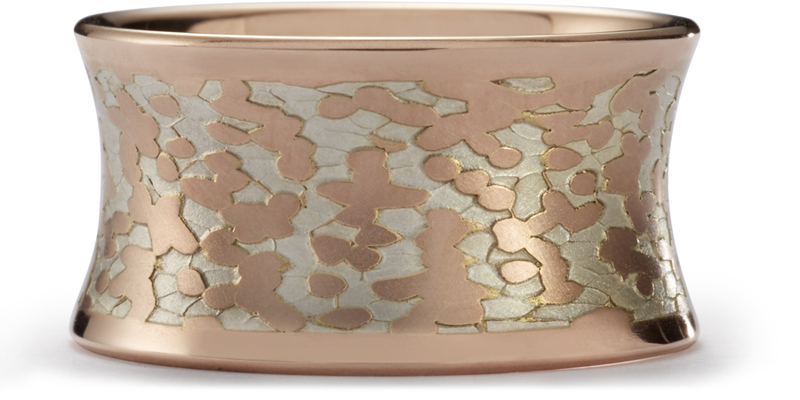 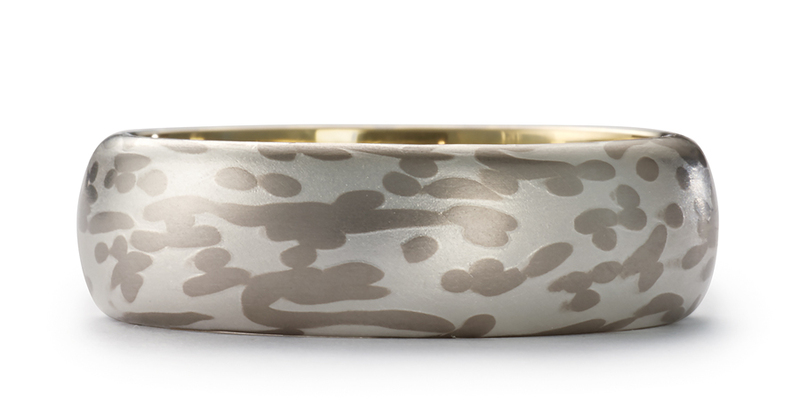 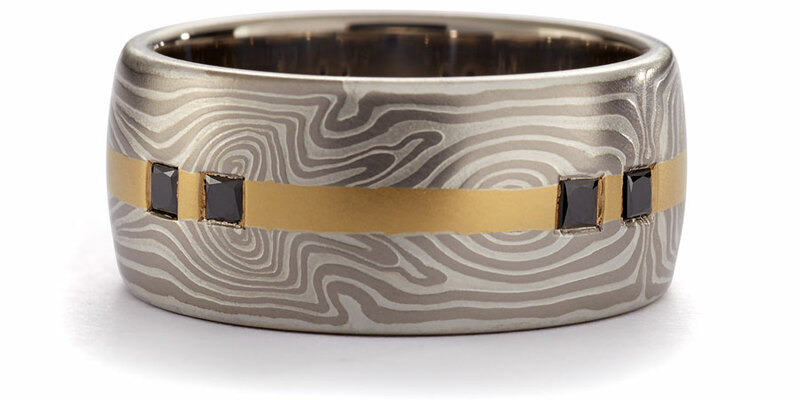 This collections incorporate metals used in the gold mokume but in a new way. 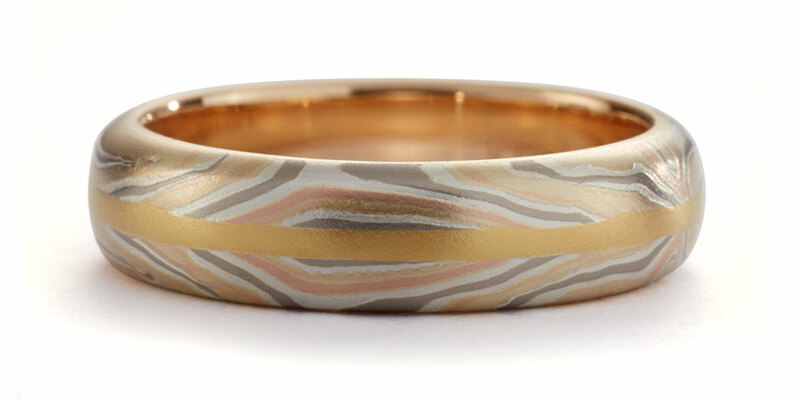 Available in Spring, Summer, Fall and Winter color combinations and several widths. 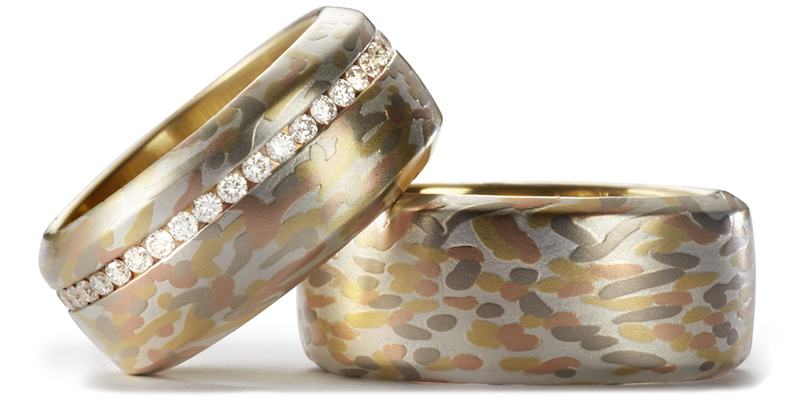 KOI® Available in 10mm, 8mm, 7mm, 6mm and 5mm widths. 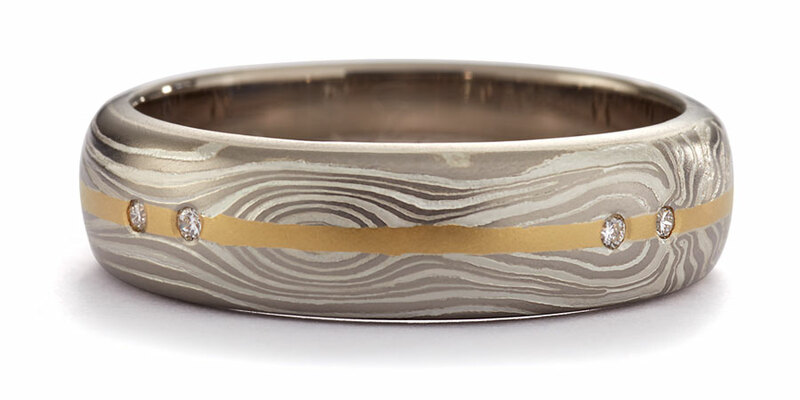 WABI SABI™ Available in 10mm, 8mm, 7mm, 6mm and 5mm widths. 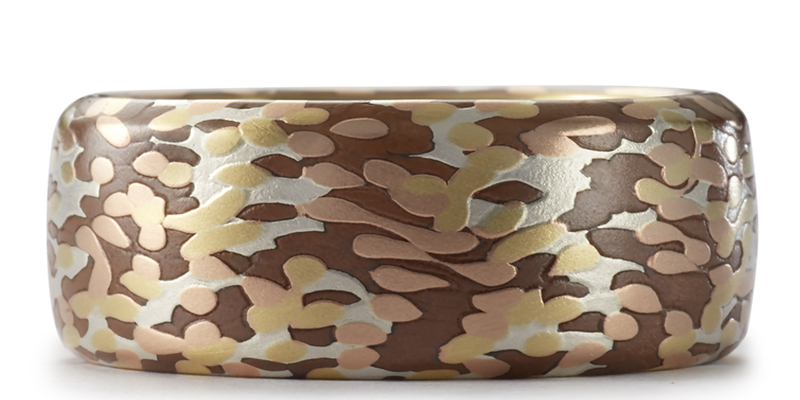 KOI® AND WABI SABI™ WITH ADDED STONES Available in 10mm, 8mm, 7mm and 6mm widths. 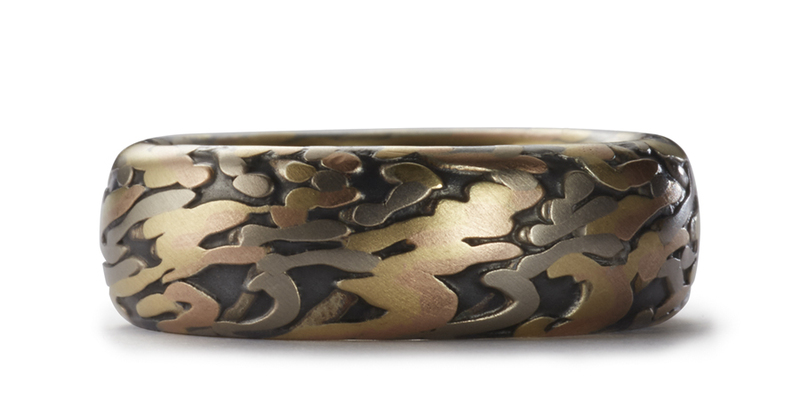 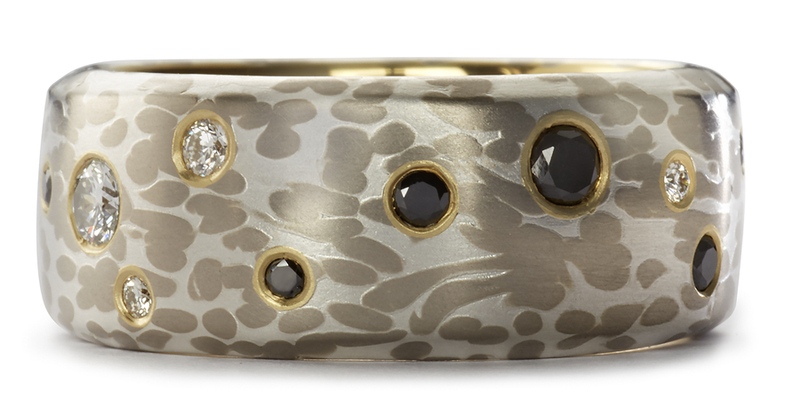 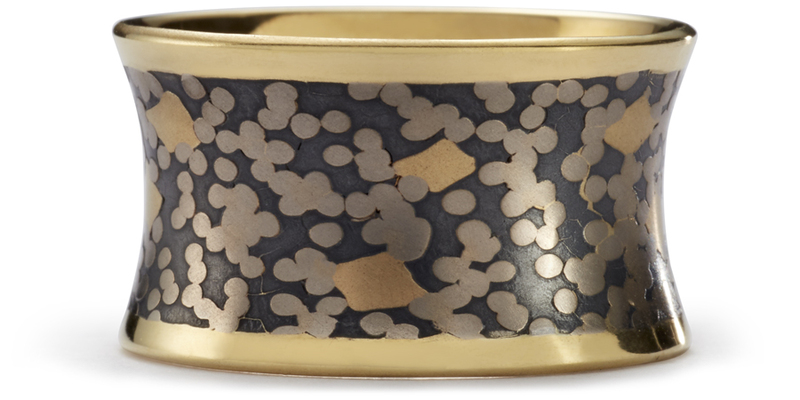 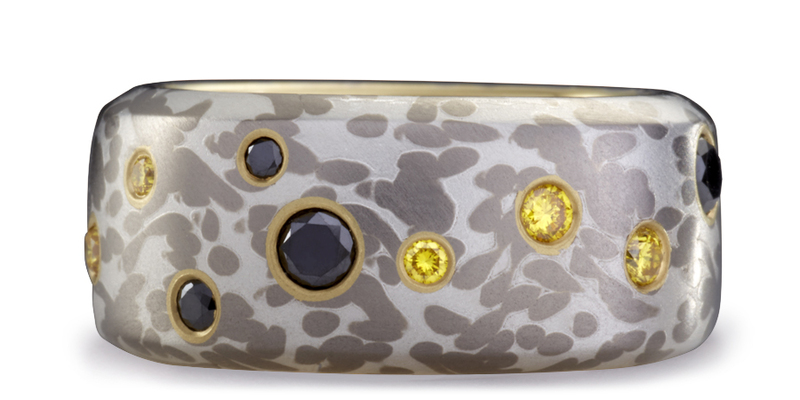 Our newest style collection features rings and cuff bracelets in our Koi® and Wabi Sabi™ style metalwork. 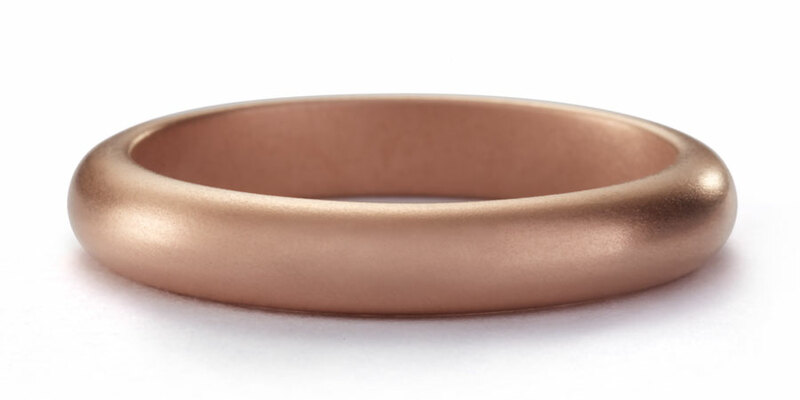 They are available in Spring, Summer, Autumn and Winter color combinations and widths of 12mm and 7mm. 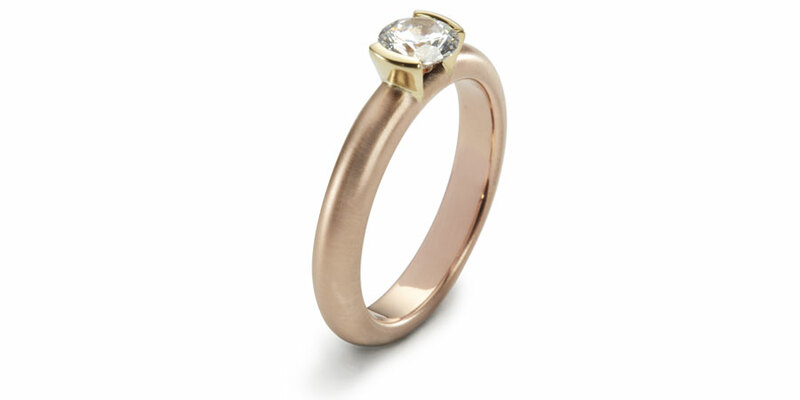 The engagement ring sets the romantic stage, tone and style for your entire wedding ring ensemble. 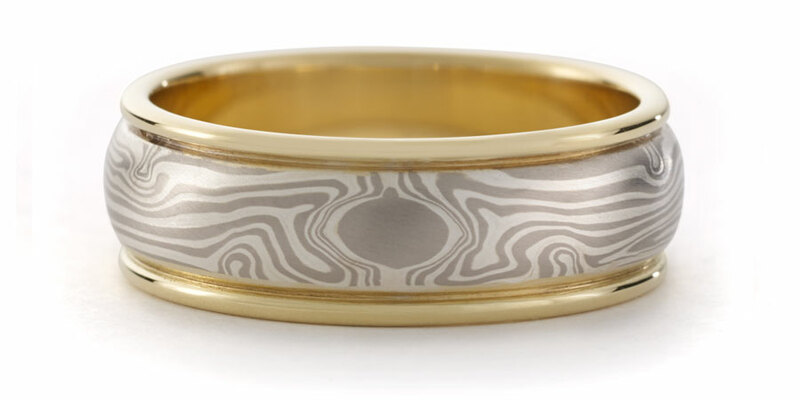 Available in 8 mokume color patterns and solid colors. 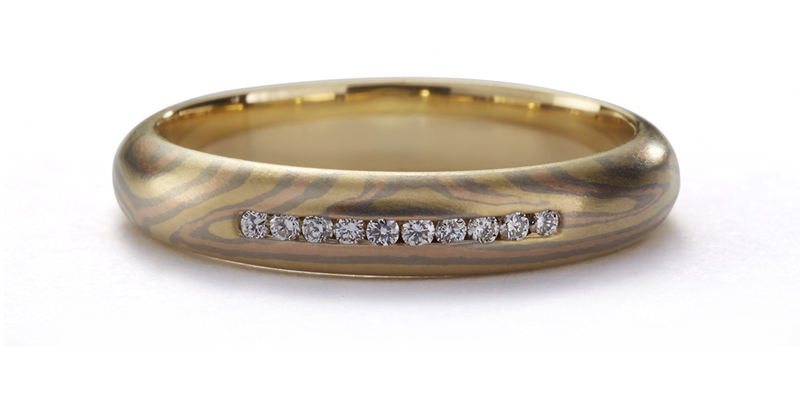 CURVED V CHANNEL RINGS Available in 6mm, 5mm and 3.6mm ring widths. 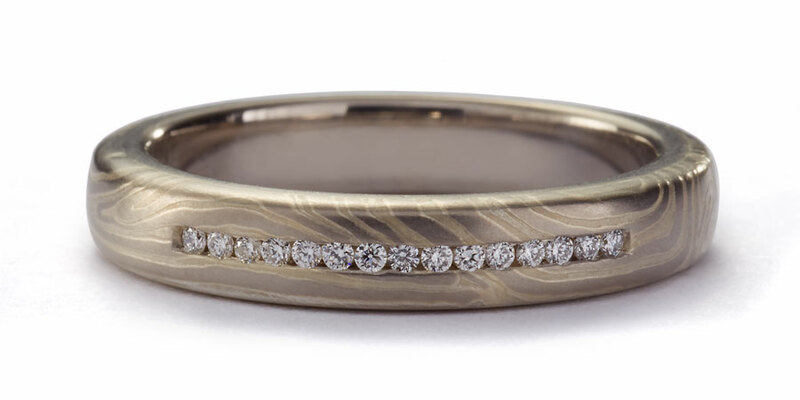 Accommodates round stones 4mm-8mm diameter. STRAIGHT V CHANNEL Available in 6mm, 5mm and 3.6mm ring widths. 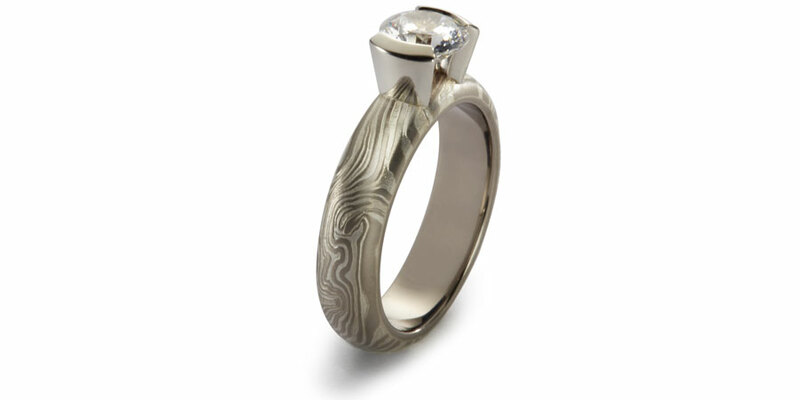 Accommodates round stones 4.5smm-8.5mm diameter. 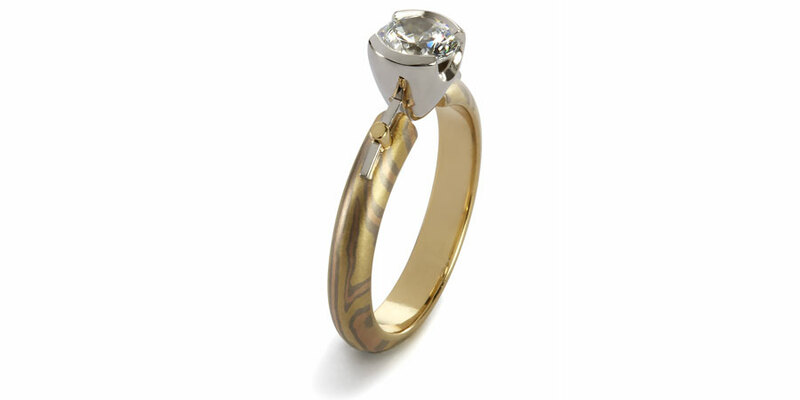 CONE WITH CHANNEL SETTING Available in 5mm and 3.6mm ring widths. Accommodates stones 4.5mm – 6.5mm diameter. 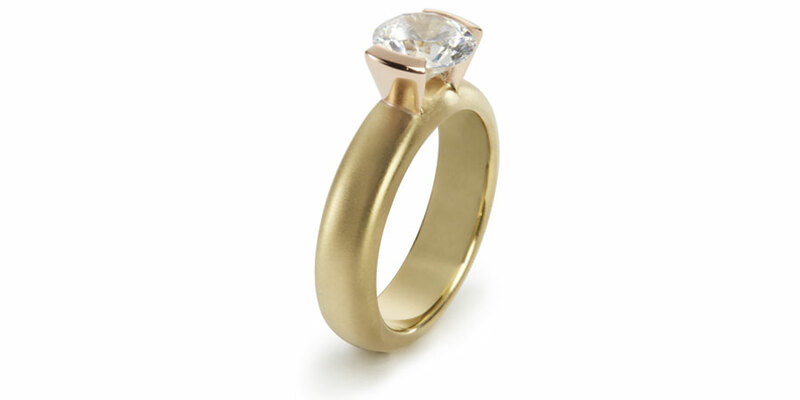 FOUR POST CONE SETTING Available in 3.6mm and 5mm ring widths. 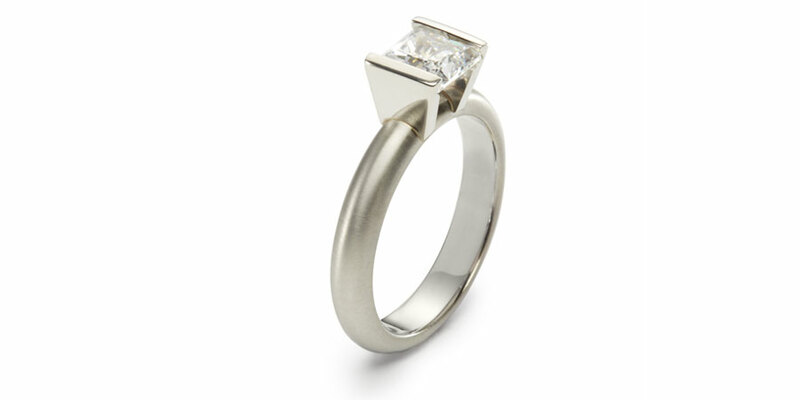 BELL ENGAGEMENT Available in 3.6mm and 5mm ring widths. 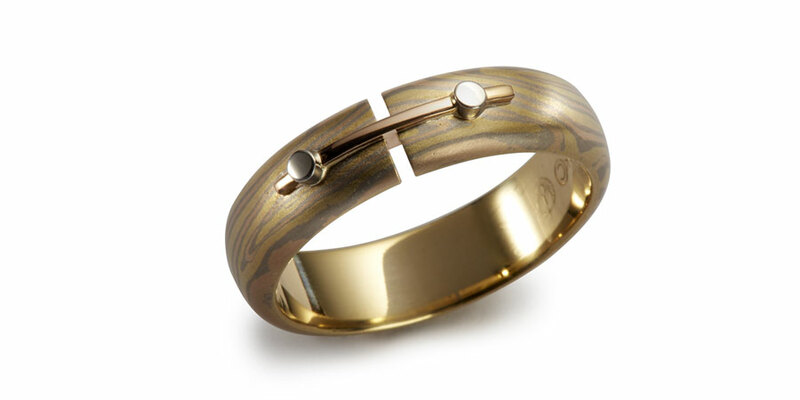 Accommodates round stones from 4.5mm- 7mm diameter. 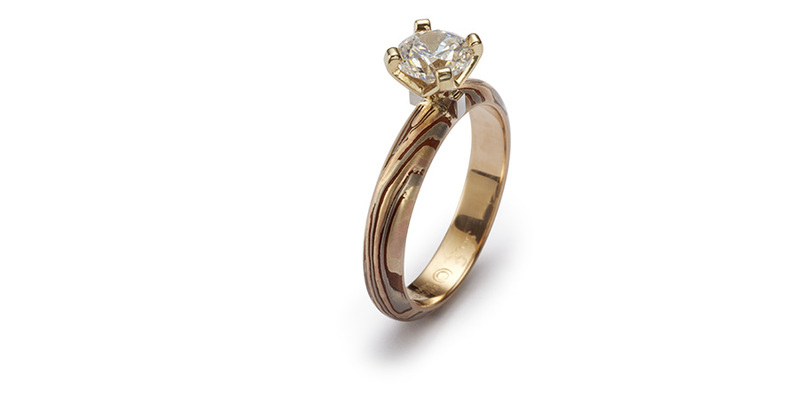 FOUR POST BELL ENGAGEMENT Available in 3.6mm and 5mm ring widths. 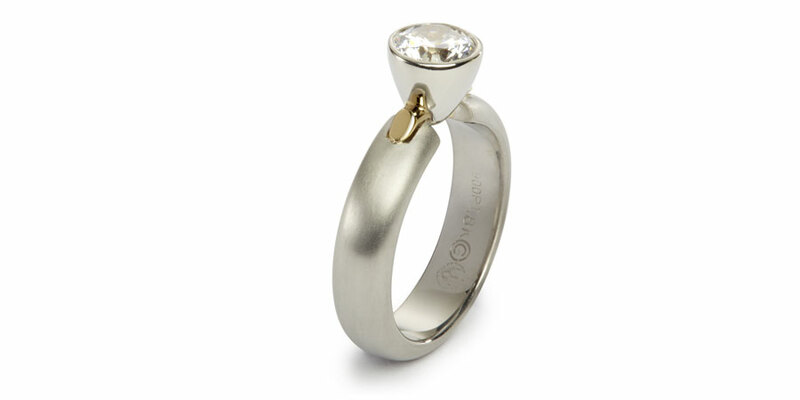 Accommodates round stones from 4.5mm-7mm diameter. 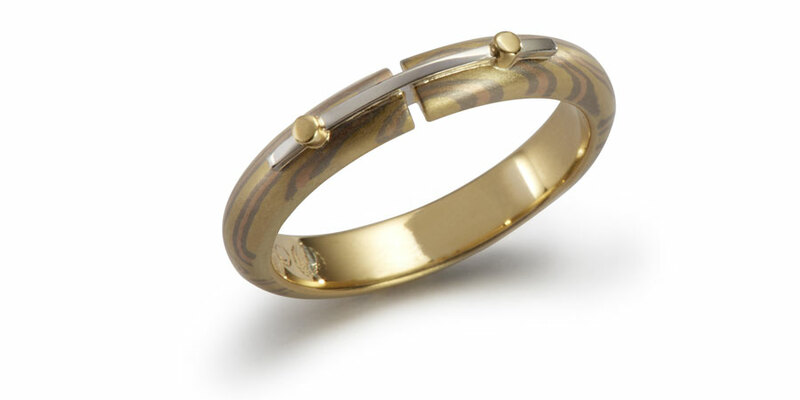 BRIDGE WITH BELL Available in 3.6mm and 5mm ring widths. 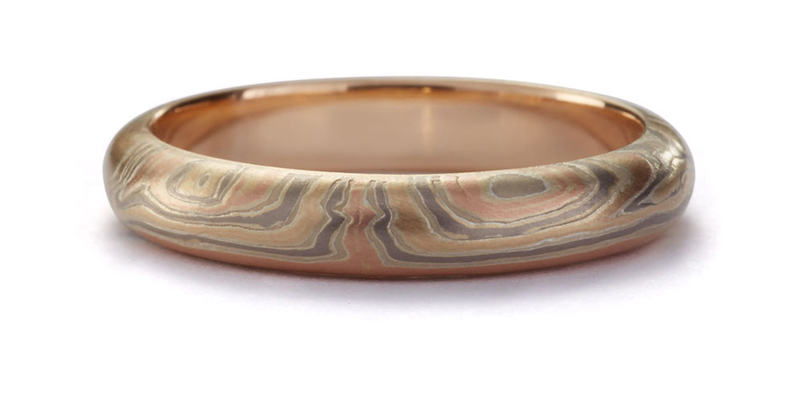 Accommodates round stones 5mm-7mm diameter. 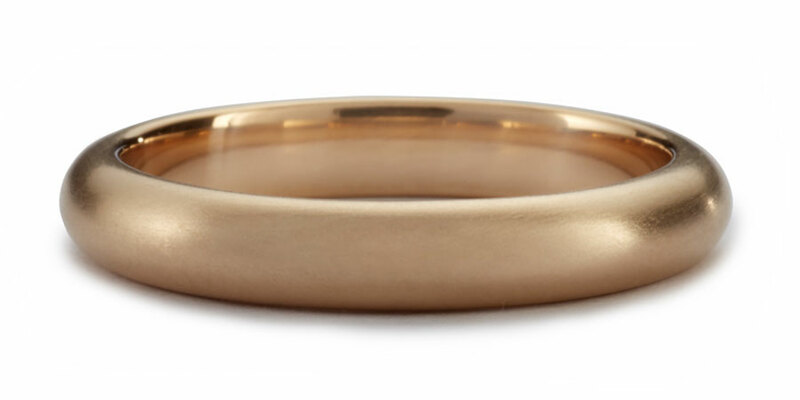 BRIDGE WEDDING RING Available in 10mm, 8mm, 7mm, 6mm, 5mm &3.6mm widths. 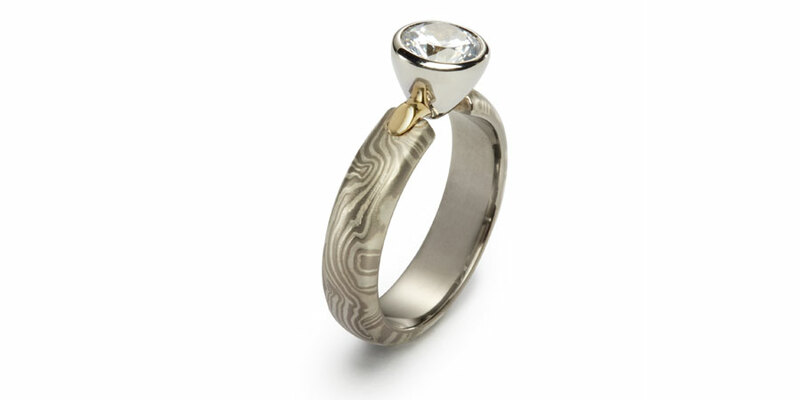 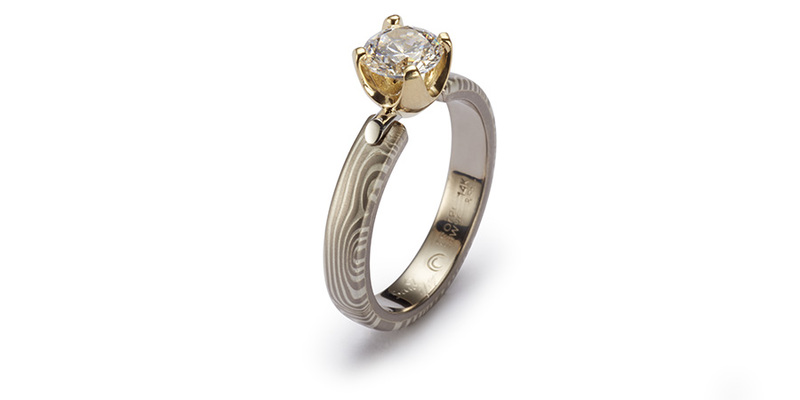 KOI AND WABI SABI ENGAGEMENT RINGS Available in 5mm and 6mm ring widths. 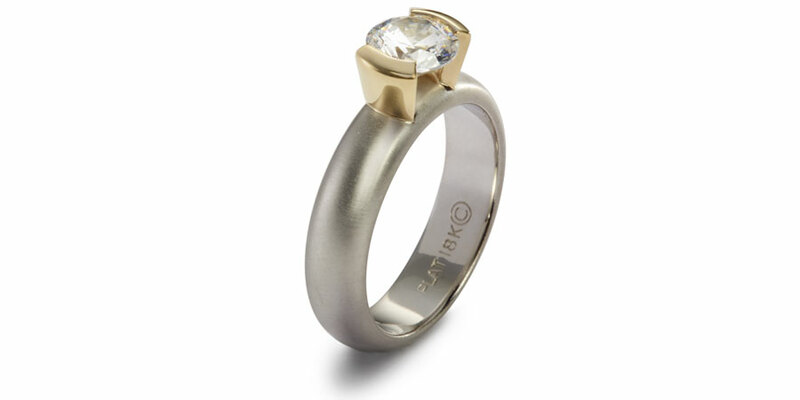 Accommodates round stones from 4.5mm-7mm diameter, accommodates cushion, emerald or square 4.5mm – 8.5mm diameter. 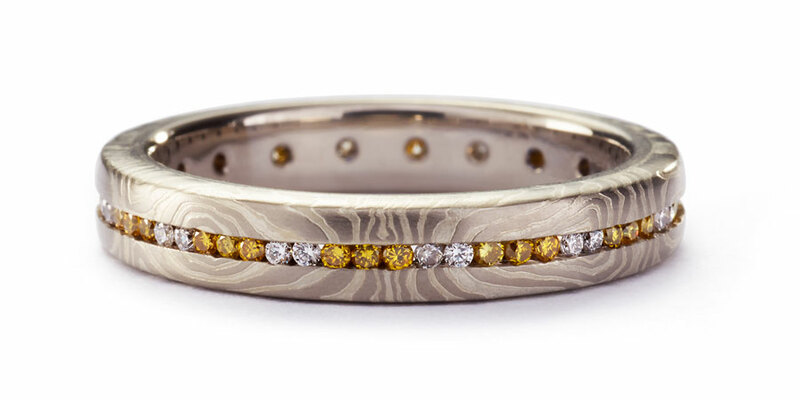 – 14kt gray gold with etched sterling silver , 22kt yellow gold center detail. 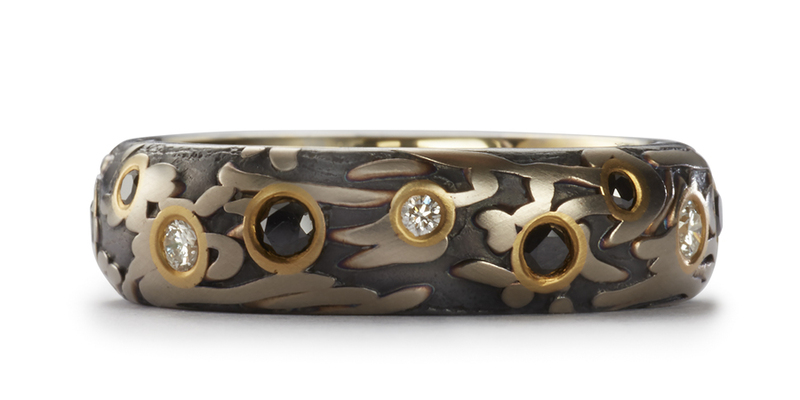 Set with 8 black diamonds .36ctw. 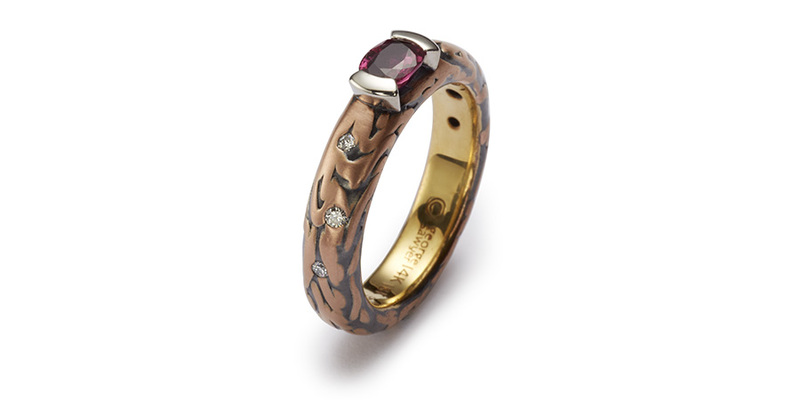 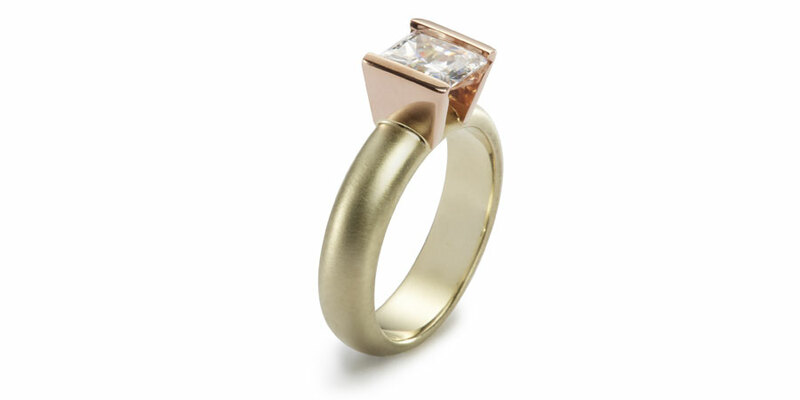 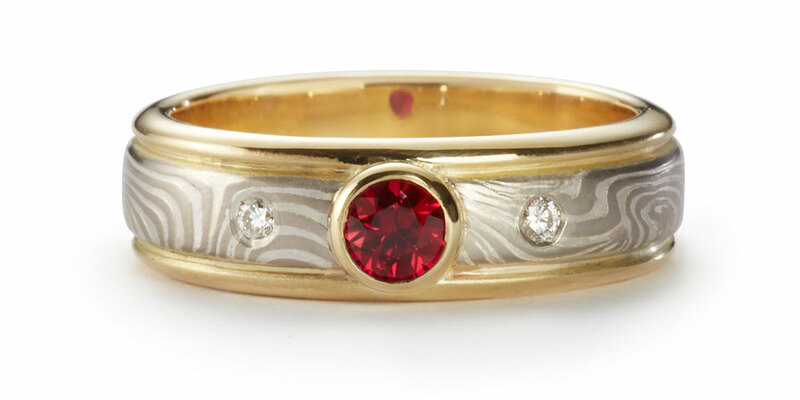 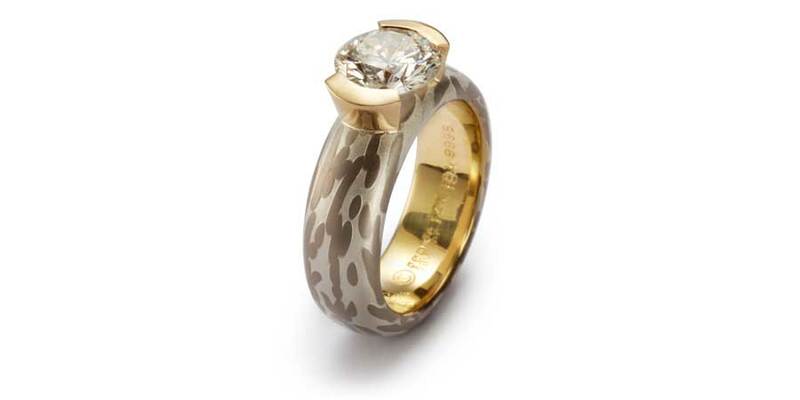 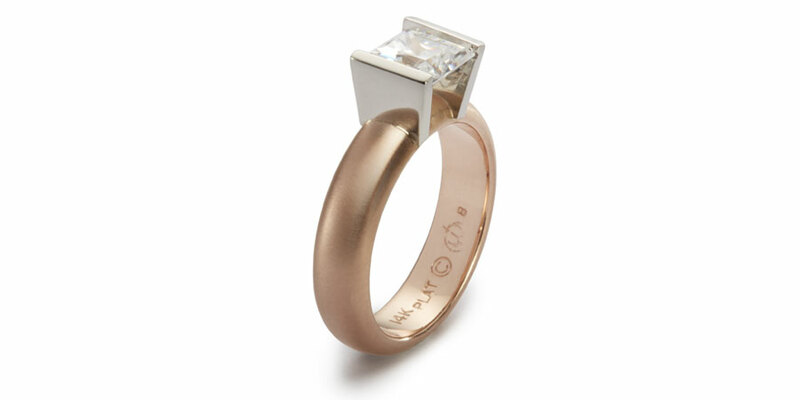 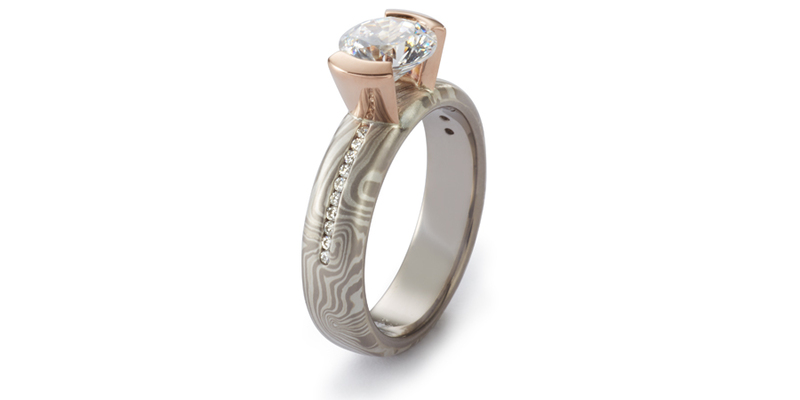 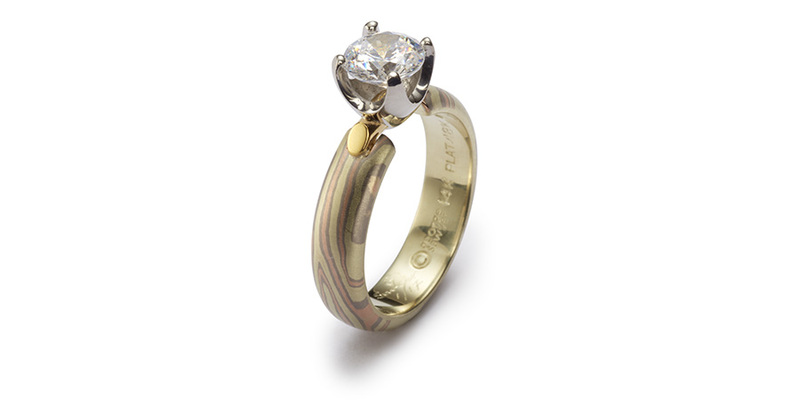 – 14kt red gold with lightly etched fine silver and 7 1.5mm white diamonds .11ctw. 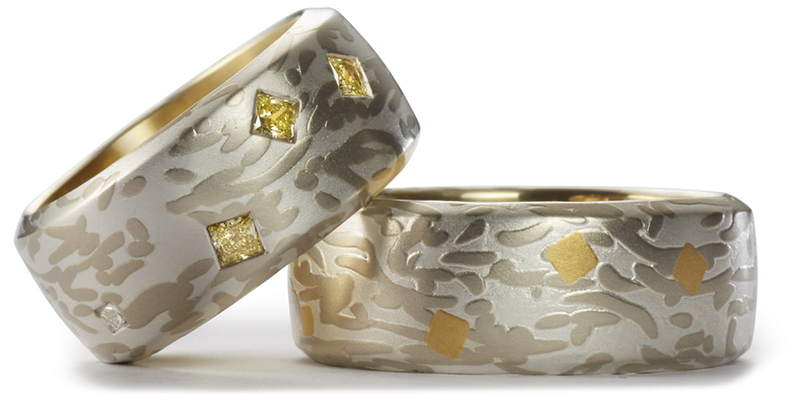 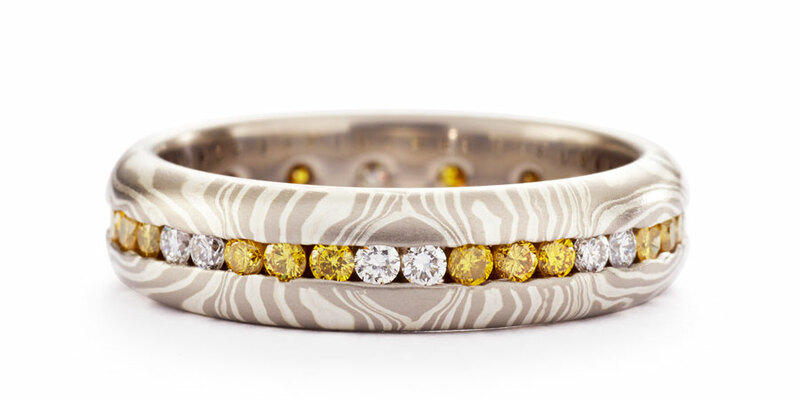 – 14kt gray gold and lightly etched fine silver set with intense yellow diamonds .22ctw and white diamonds .60ctw.